I will soon need to change the disclaimer in my "bio" on this blog since I have accepted a position with the MBTA. I will be working as a Project Manager in the Capital Delivery department, focused on Commuter Rail projects. I start my new job later in October. Capital Delivery is the organization within the MBTA responsible for the execution of capital projects - planning, designing, & constructing stations, tracks, signal systems, and other parts of the infrastructure needed to operate all modes of transit - including procuring the "rolling stock" we ride in. Capital Delivery is where the projects and spending are to attack the unfinished backlog of "state of good repair" needs that you keep hearing about. There are different departments (separate from Capital Delivery) tasked with operations of the various transit modes. The MBTA Railroad Operations department is the department tasked with oversight of Commuter Rail, including oversight and implementation of the Keolis contract. So although I may need to work with RR Ops on particular topics that intersect with capital projects, I won't be working in RR Ops and therefore won't have a close connection to operational issues (or much to do with Keolis). Capital Delivery has been in the news over the past months for not spending the full value of funds allocated and available for projects - see this article here for example. Part of that problem is understaffing in the Capital Delivery department - hence the job openings and my filling of one of those! Obviously my advocacy made we aware of the job opportunities within Capital Delivery and I was able to talk to some folks about the opportunity. But I had to apply and go through the process just like anyone else. I'm not sure what my new job will mean for this blog and my Twitter account. I hope to be able to continue to share some helpful information, but my job is definitely not within the communications department. I will have to defer to the rules and regulations (e.g. social media policy) of the MBTA. I'm looking forward to bringing my perspective as a 15+ year commuter rail customer - as well as my professional experience as an engineering project manager - into my new role at the MBTA. I'm also grateful to everyone I've encountered through this blog and through my other forms of advocacy - my perspectives have been widened by you and I'll be able to bring that wider view with me into the agency. I haven't worked in the public sector previously, but I'm especially aware of the responsibility I'll have to steward our money - whether it is taxes or fare revenue, it is our money that I'll be using to get work done. I'm only going to be a Project Manager - a small part in a big machine - so I won't be in a position to change the world or make drastic policy or strategic decisions. But for the small decisions I will be able to make, I'll try to make them count. Thanks for your engagement here and on Twitter. If this turns out to be the end of my public conversations, please know that I have enjoyed maintaining this blog and sharing my knowledge with you. P.S. (added 10/14/2017): I'll still be riding the commuter rail! My new office is very close to my existing office, so I'll still be riding the Framingham-Worcester line to South Station. Hunt me down to chat. 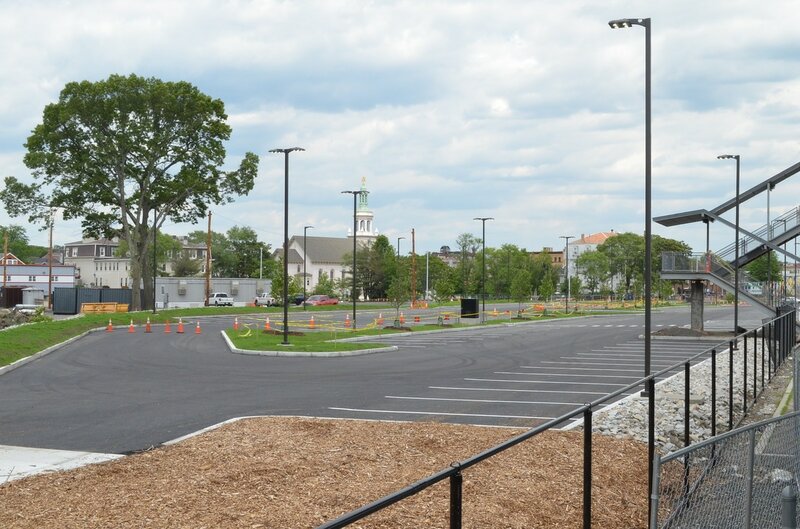 "Banana Lot" - the existing parking lot, north of the train station and north of the eastern side of the freight track wye leading to the CSX North Yard. It's called the "banana lot" because it is shaped like a banana alongside the freight track. Access to the Banana Lot is via a small unnamed side street off of Howard Street in downtown Framingham. Use "47 Howard Street" in your GPS to get you to the general area. "Infield Lot" - my new name for the new parking lot on the "infield" or between the west and east legs of the wye leading to the CSX North Yard. This lot is directly north of the train station platforms. We'll see if we can make my new name stick. 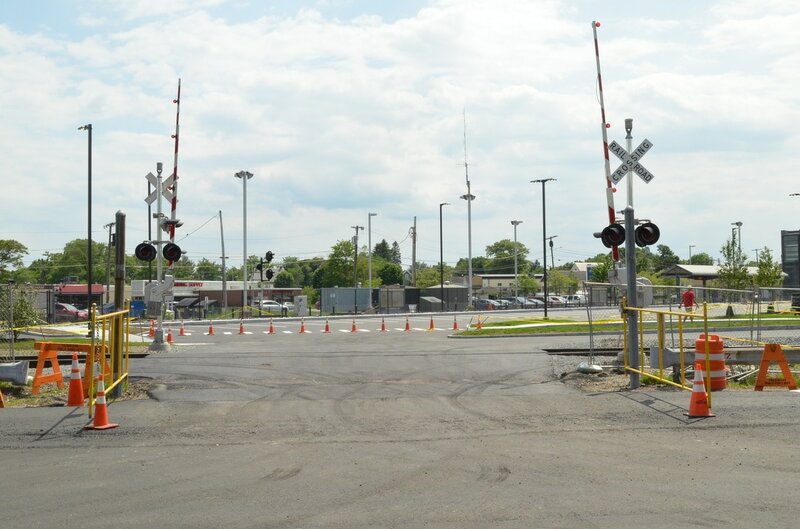 Access to the Infield Lot is from the Banana Lot via a new grade crossing across the freight track. 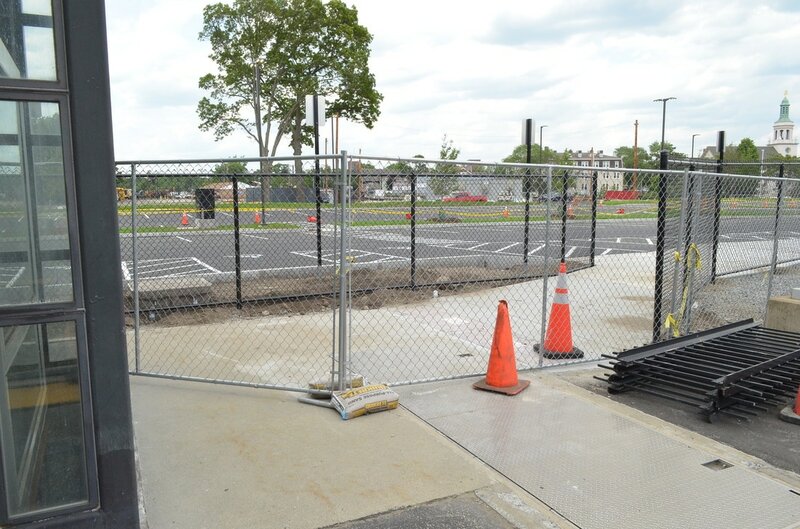 "Route 135 / South Lot" - the existing parking lot along the south side of the main line tracks, directly adjacent to REoute 135 / Waverly Street. No modifications are being made to this lot. 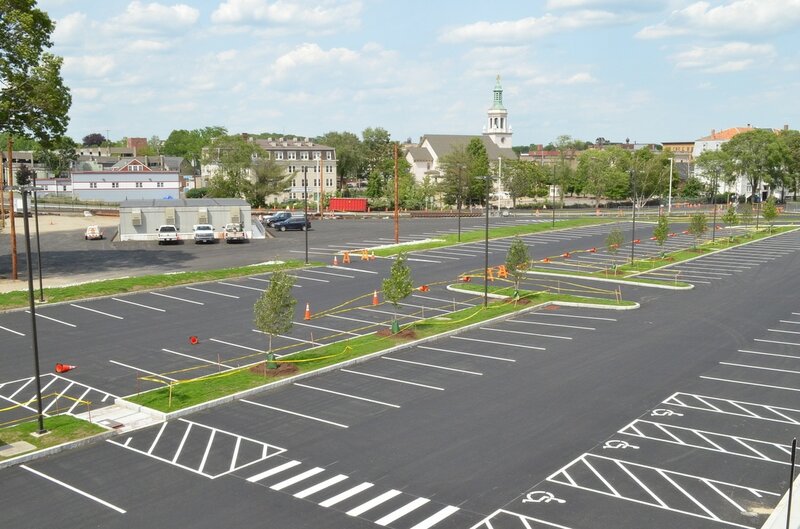 All of these lots are owned by the MBTA and managed by the MWRTA. They are all zone 4254 for payment by the PayByPhone app. For more details on parking apps, see item #5 here. 1) As noted in the tweet above, parking in the Banana lot along the guardrail (south side of the Banana lot) will be prohibited. I'm not sure why, but I'm guessing they might be installing additional permanent fencing along that alignment. 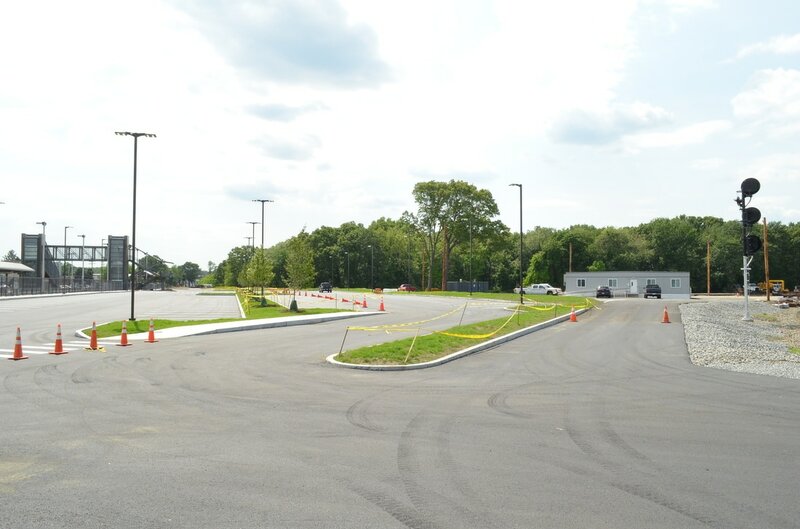 2) Only the northernmost row of the new Infield parking lot will be available. This is highlighted in yellow on the figure above, and also shown by the arrangement of traffic cones in the photos below. 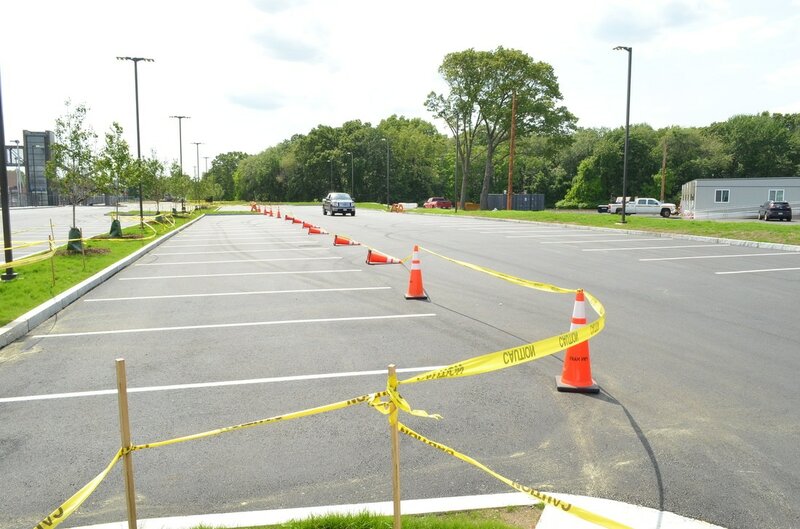 The remainder of the parking spaces are unavailable because security cameras are being installed on the light poles. It appears there will be about 50 spaces available in the Infield lot, which should be adequate to replace the unavailable spaces along the guardrail in the Banana lot. (There are additional spaces available in the Pearl Street parking garage which don't usually fill up, if you can't find a space in either the Infield or Banana lots). 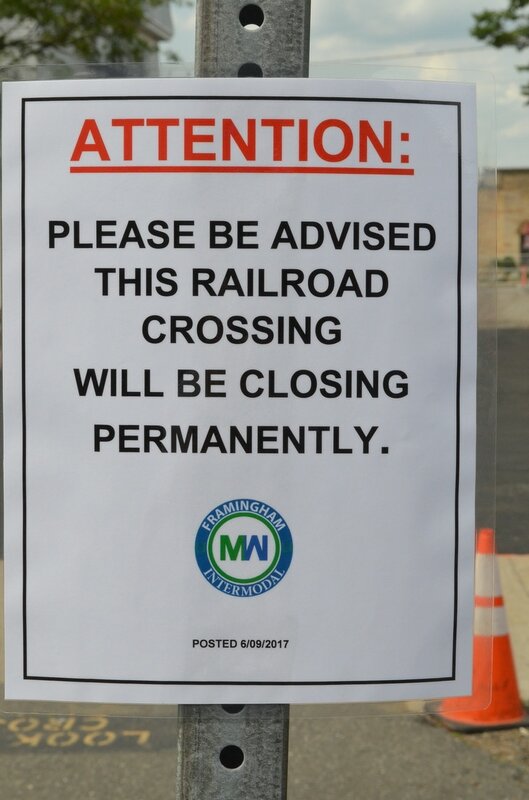 3) The existing pedestrian crossing across the freight track from the Banana lot to the main line track 1 platform will be closed permanently. 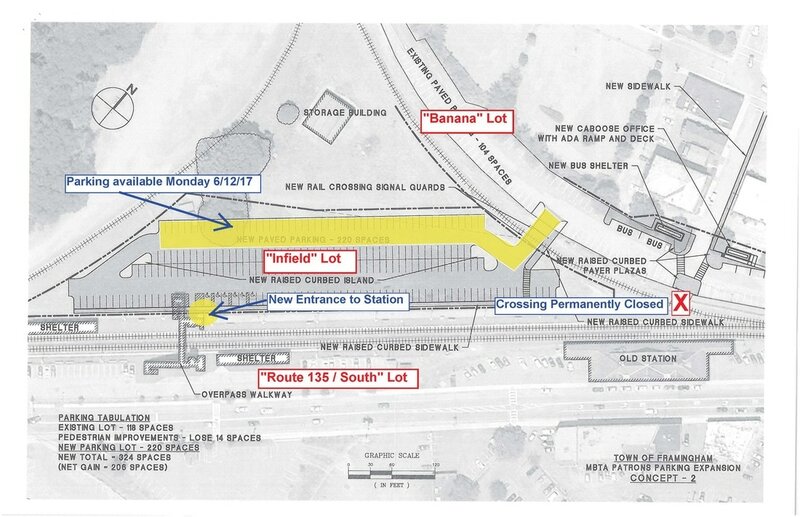 To get from the Banana lot to the station, pedestrians will have to walk to the new automobile grade crossing across the freight track and use the new access point to the station. 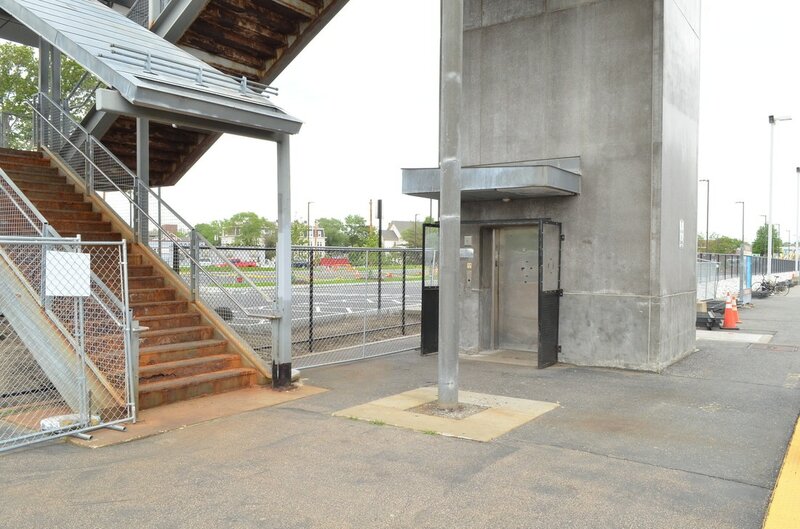 4) A new pedestrian access walkway will be open for the new Infield lot near the elevator and pedestrian bridge. See figure above and photos below. Click on any of the pictures below for a full size version. The new Infield Lot, looking northeast from the pedestrian bridge. Boston Landing - Grand Opening & More! Regular scheduled passenger train service over the former Boston & Albany railroad returns to the Allston / Brighton neighborhood on Monday, May 22, 2017, for the first time in over 50 years. 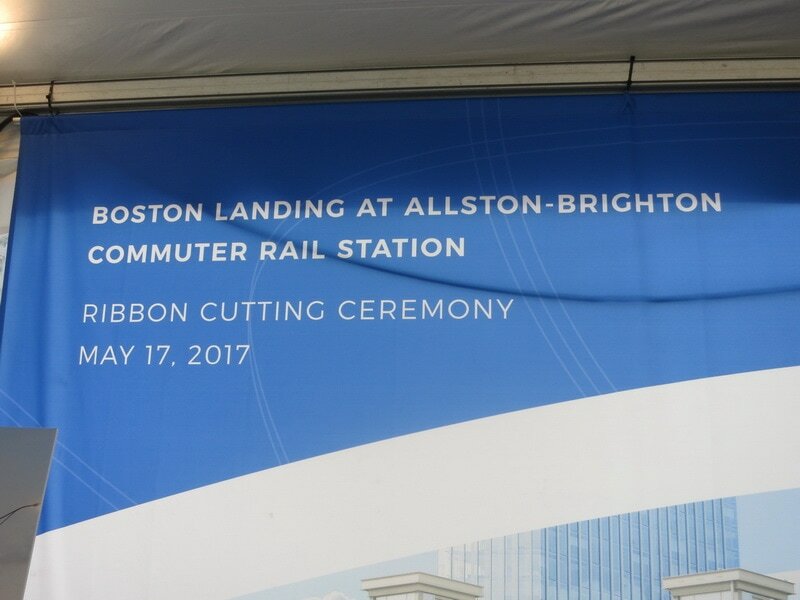 With a groundbreaking on May 12, 2015 and the "Grand Opening" on Wednesday May 17, 2017, the construction of the new "Boston Landing" station took almost exactly 2 years. I'll write a separate blog post to cover schedule changes dealing with stations other than Boston Landing. As I noted in the December blog post about the new schedule, Boston Landing was added to only the local Framingham-originating trains. This actually allows everyone to get to Boston Landing relatively easily without adding more time to the duration of the express trains. For anyone west of Framingham wishing to go to Boston Landing, they can de-board in Framingham and transfer to the next inbound local train. Each Framingham-originating local departs Framingham only about 8 minutes after the express, so the transfer wait is not onerous. This transfer process actually allows reasonable service for anyone west of Framingham going to any of the stations between Natick Center & Boston Landing. This transfer process was discussed at the Worcester Working Group, and it was certainly my understanding that there would be no fare penalty for making this transfer. For example, a passenger travelling to Boston Landing from Ashland should only have to pay the zone 6 one-way fare ($10.00) rather than a 2 zone interzone fare ($3.25) plus a zone 5 one-way fare ($9.25). I have not followed up to find out if there has been any official policy change or procedure implemented for train crews to be able to implement the transfer process. This is only an issue for someone buying a single ticket, since monthly passes allow unlimited usage (and therefore unlimited transfers). There were very few comments received during the public comment process regarding the inbound AM service. Some express train passengers NOT going to Boston Landing did like the idea of not adding the Boston Landing stop to the express trains (since it would increase the overall duration of those trips). Since the publication of the final schedule in late April, I have heard some comments from passengers intending to get to Boston Landing from west of Framingham and those comments have been critical of the need to make the transfer in Framingham. 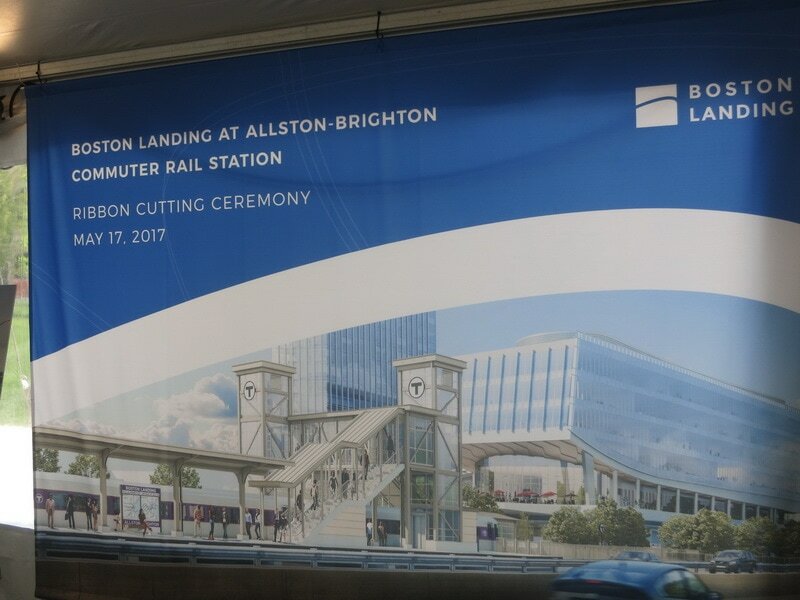 A number of comments were received during the public comment period from passengers intending to travel from downtown Boston (or connecting transit services) to Boston Landing. Four trains make stops at Boston Landing to accommodate these passengers. However, a number of comments noted the long gap between P589 (arriving at Bostong Landing at 7:45 AM) and P509 (arriving at Boston Landing at 9:06 AM). This gap is the result of the 'end' of peak inbound service from the suburbs - the P589 equipment turns at Framingham to become the last inbound peak train, P590. P509 goes to Worcester as essentially the first 'mid-day' train. 1Bi.a) Boston Landing passengers can get to P521: P521, the 5 PM South Station express to Worcester, is the most popular evening train. Although it doesn't stop at Boston Landing, those passengers can take INBOUND P520 from Boston Landing at 5:04 PM and get off at Yawkey at 5:09 PM. They can then board outbound P521 at Yawkey at 5:11 PM. 1Bi.b) Boston Landing added to P525: A stop at Boston Landing has been added to P525 since there is no corresponding inbound-outbound trick for Boston Landing passengers to access P525. 1Bi.c) Use bus 57 to access outbound trains at Yawkey: The other option to access either P519, P521, or P523 is to use the inbound 57 bus along Brighton Ave and Comm Ave to Kenmore and then walk over the MassPike to the Yawkey Commuter Rail station. The 57 bus operates about every 5 min around the time of those trains. During the public comment period, a number of comments were received from passengers intending to travel from Boston Landing back into downtown Boston during the evening commute. All seven trains passing Boston Landing inbound from 3:00 PM to 8:00 PM will stop at Boston Landing to accomodate these passengers. However, there is a large gap between P518 (departing Boston Landing at 3:07 PM) and P520 (departing Boston Landing at 5:04 PM). Most of the comments submitted noted this large gap. This gap is due to the gap in outbound midday service from P513 (departing South Station at 11:55 AM) and P515 (departing South Station at 2:00 PM). These trains turn at Worcester to become P518 and P520). With no other equipment west of Boston during those times, it is impossible to generate inbound service between those sets of equipment. Adding an outbound train departing South Station at 1:00 PM would generate a return inbound trip that would stop at Boston Landing at around 4:05 PM - cutting the two hour gap to one hour between trains. Something that we may want to advocate for in the future. This initial schedule for Boston Landing service focuses on 'typical' 9-5 (approximately) workers at Boston Landing - arriving at Boston Landing from the west or the east. There are a number of inbound and outbound trains that skip Boston Landing in the middle of the day, and no service inbound or outbound for Boston Landing after 8:01 PM. Although I advocated for adding Boston Landing to all of those trains, only ONE other person submitted a comment during the public comment period advocating for this expanded service. I was amazed and was expecting an outpouring of comments from the Allston-Brighton community requesting more service - especially for evening service to and from downtown Boston. Faced with a lack of public demand for more service than what was shown on the draft schedule in December, the Worcester Working Group agreed to keep the service level at what was published on the draft schedule. We all agreed that this can be revisited and service added to the next schedule revision (November 2017) if there is a public demand for more service. 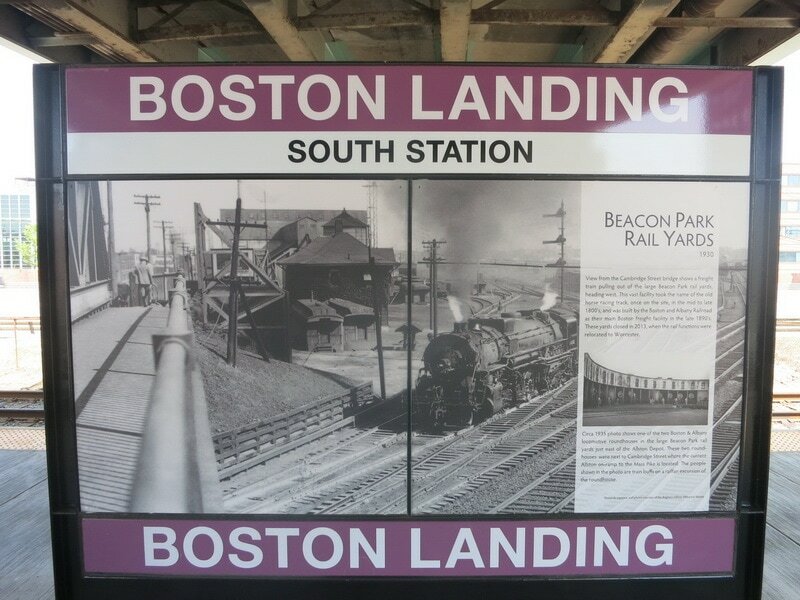 I'm definitely interested in hearing about your experience if you're a new Boston Landing commuter! Leave some comments below. 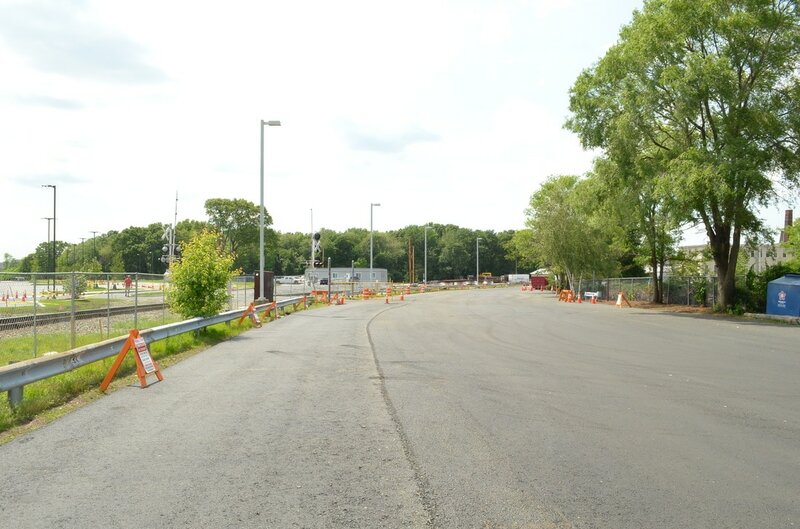 One of the biggest benefits that will affect ALL riders of the Framingham-Worcester line is the replacement of the 50+ year single track section between Yawkey and the location of Boston Landing station with a double track main line. This will improve the reliability, resiliency, and schedule flexibility for ALL train trips. Although I can't be sure, the reason for only maintaining one track towards South Station is probably due to fact that in the 1960's, with most commuters switching to car travel, commuter rail service had been reduced to a single set of equipment that made a few trips back and forth to Framingham each day. With only one commuter rail train in service, it could easily operate on one track (track 2) from South Station to Framingham - leaving track 1 available for freight train service. This would also explain why the platforms at the three Newton stations were constructed on track 2 only - it was going to be the "passenger" track while track 1 was used for freight. Clearly the thinking in the 1960's (with the construction of the MassPike extension) was that the auto was the future. By December 2015, CSX had relocated all of their freight service out of the Beacon Park yard. This allowed the freight leads to be removed and replaced with a "shoo fly" track to enable the construction of the Boston Landing station to proceed without trains directly alongside the new station. 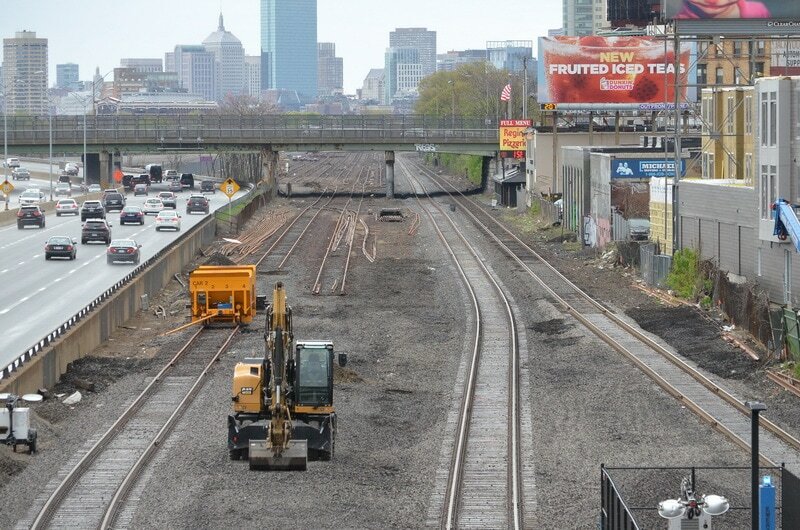 With CSX moved out of Beacon Park yard, land was now available to reconfigure the tracks so that a second mainline track could be added to eliminate the only gap in double track mainline between Worcester and Boston. Since Boston Landing was being constructed by the developer, an arrangement was made that stated if the MBTA constructed the second track through Beacon Park before Boston Landing was completed, the Boston Landing construction crew would connect their two station tracks to the 2 mainline tracks going east through Beacon Park. The result is the final configuration of Boston Landing station. The track work was actually completed with a shutdown of service over the weekend of 4/29/2017-4/30/2017. Here are some pictures from 4/30/2017 showing the (almost) final track arrangement (construction of the freight lead is not yet complete in this picture, and it's still unknown to me if there will be two freight leads under Cambridge Street). I was privileged to attend the Grand Opening ceremony for the station on Wednesday 5/17/2017 (with my wife!). Quite the ribbon cutting with what seemed like an endless line of politicians and dignitaries! Polito: "Worcester Line riders have a lot to say." That might be an understatement. 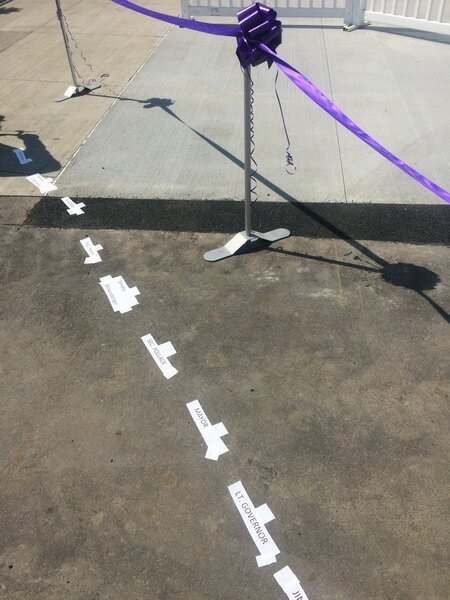 How do they all know where to stand to cut the ribbon? The historical photos they found for the station posters are fabulous. The two areas at each end of the platform are accessible via a ramp that is normally blocked by an "emergency exit" gate. These are "areas of refuge" and their implementation at Boston Landing station is somewhat of an odd artifact of a code requirement. Fire code now requires an "area of refuge" for people unable to use a stairway to escape a potential fire in a space that is not protected by a sprinkler system. The area of refuge is intended to be a safe space (equipped with two-way communication, hence the blue post with the call box on it) where people can shelter away from a fire danger until they are able to be rescued. It is not intended to be a path or route OUT of a building or the area of danger, but rather just a temporary holding place. 4B. 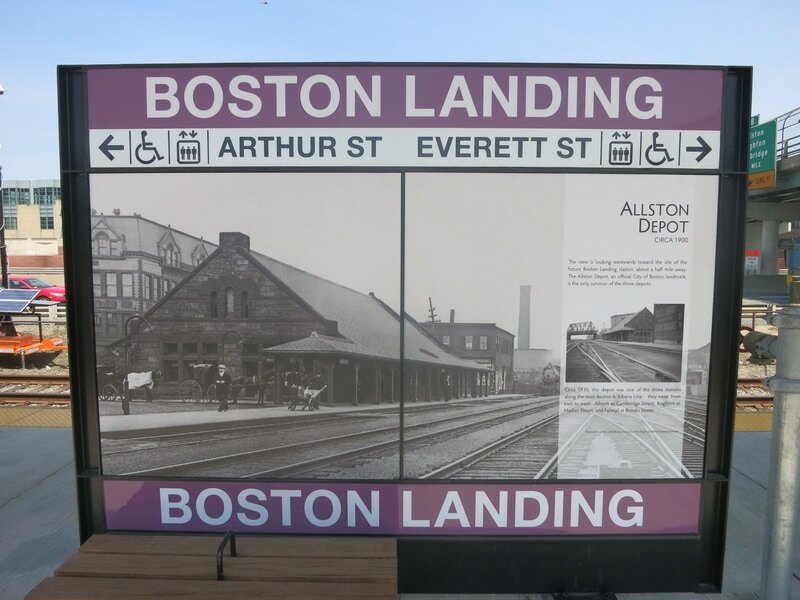 Why is the station that Boston Landing paid for not even adjacent to Boston Landing? 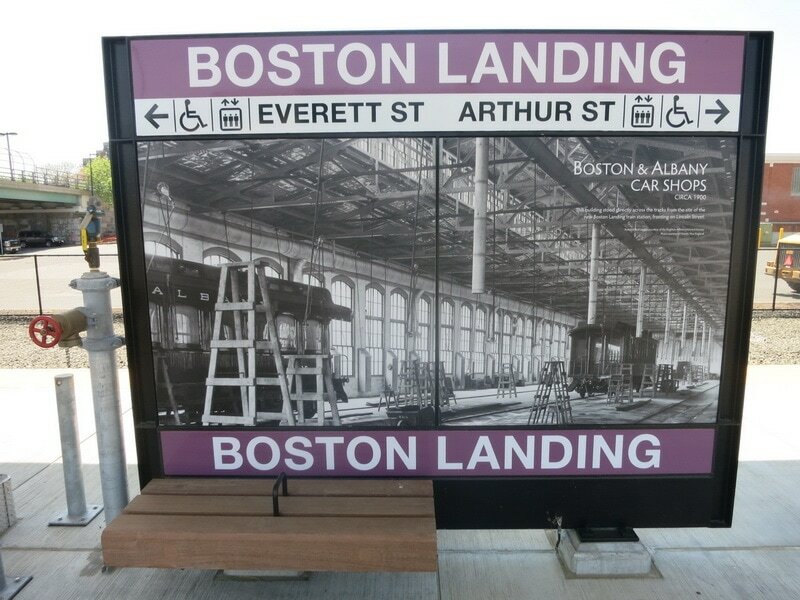 The Boston Landing station is well to the east of the main portion of the Boston Landing development. 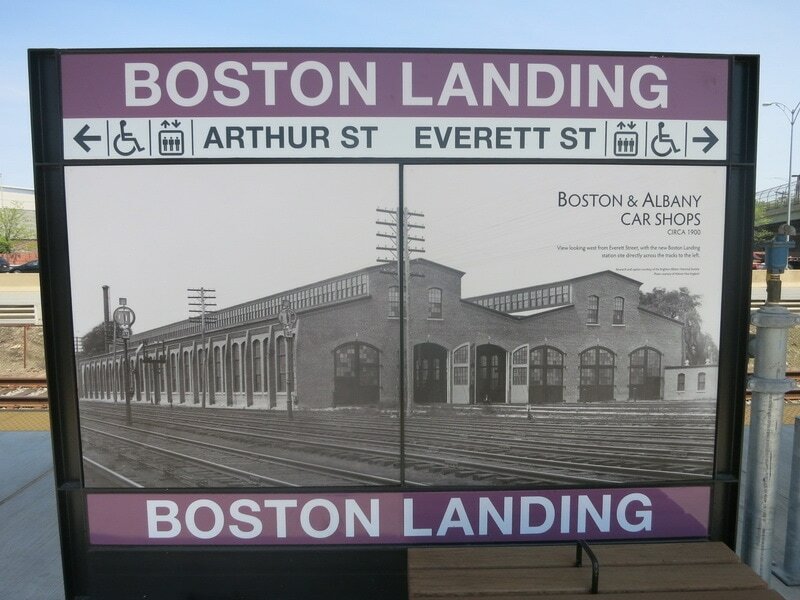 In fact, the main entrance to the station is down a path about 100 feet east of the northeastern corner of the Boston Landing development. 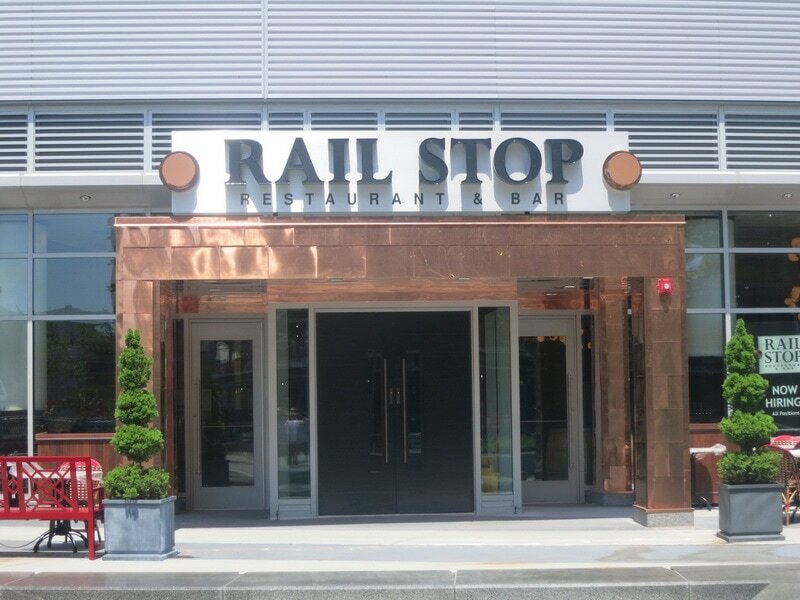 Once the Stop & Shop is torn down and replaced with the upcoming development there, the station will appear to be more a part of that development than Boston Landing! The answer is track geometry and available land. 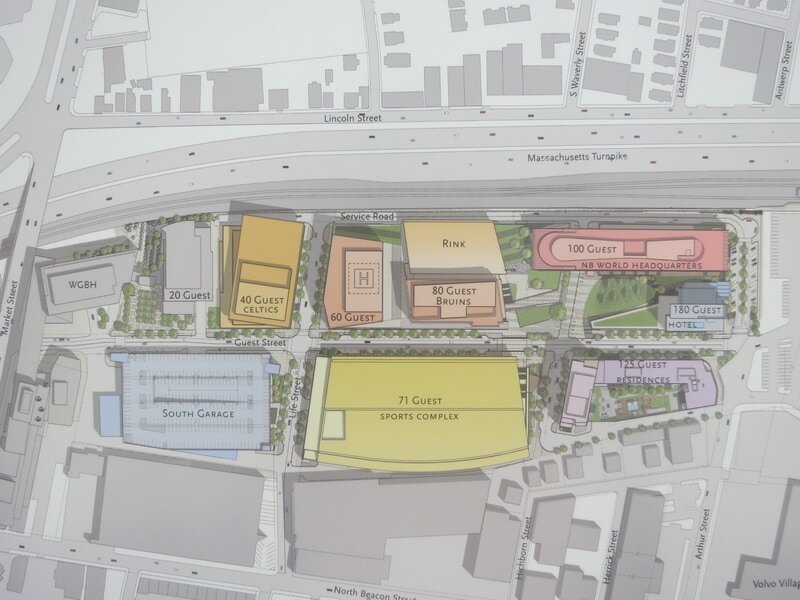 First, the available land between the Boston Landing development and the MassPike is too narrow for a station. Second, even if there were enough land, the area directly north of the Boston Landing development has tracks still curving out of the curve just to the west. It is much better and much easier to put a station on a straight section of track, primarily because it is much cheaper and easier to build things at right angles rather than with customized curves. In addition, building a platform on a curve increases the 'gap' between the train and the platform since the ~80' long coaches can't conform to a curved shape. Finally, the additional land available to the east of the area north of the Boston Landing development allowed space for the 'freight lead' switch. NOTE: This blog post has been updated on 4/14/2017 to modify the scheduled time for P512 as per the following tweet. The time for P512 has been temporarily adjusted for a few weeks due to the track work project (more info here about that). Apparently they are keeping that temporary change in place even though there will be NO track work on Monday. All of the schedules below have the correct adjusted time for P512. ​Our friend Ari had a great idea for a consolidated schedule that incorporates the extra trains announced for Marathon Monday. The official details are on this page. 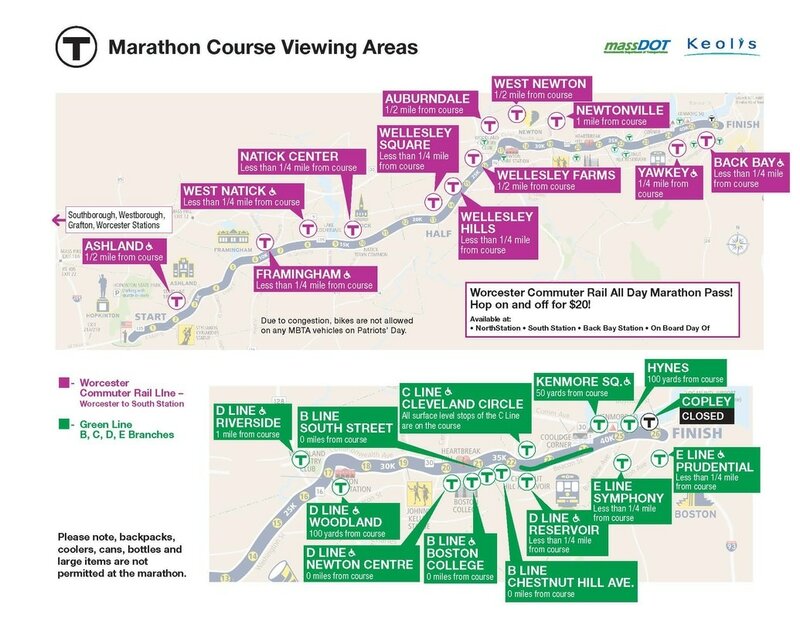 There is a different page here with more details about the MBTA and the Marathon. The weather looks relatively good for Marathon Monday, so expect overcrowding and slight delays on the mid-day trains with lots of spectators using Commuter Rail. At least that's what has happened in recent years. Finally, if you are along the marathon route during the overnight hours from Sunday to Monday, don't be surprised to see a thousand or so bikes.... the "Midnight Marathon Ride" has grown exponentially over the past few years. Ari estimated the ridership below. NOTE: Starting at 8 PM on Sunday night for the Framingham-Worcester line, and for the entire MBTA system all day Monday, NO bikes are allowed. That includes folding bikes. NO folding bikes allowed. The entire MBTA system is typically very crowded Monday, so it is a rule to preserve capacity for people. I'll cover Boston Landing and the single track through Beacon Park in a separate blog post. 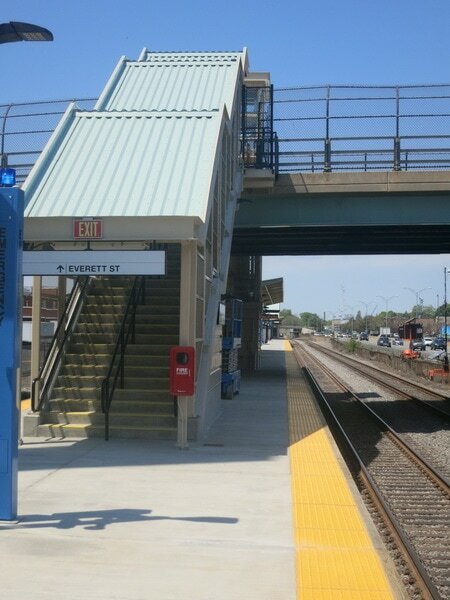 The mini-high platforms (one for each track) at West Natick are the platforms at the far western end of the station where the platforms are at the same level as the train vestibule, enabling passengers to board the train without climbing up stairs. They provide handicapped accessibility for boarding and deboarding trains. The mini-high platforms were removed from service at least a year and a half ago - I can't find a reference to an exact date but the situation was noted in this Fox 25 report in March 2016. The mini-high platforms were removed from service due to deterioration of the concrete structure and the unsafe condition of the 'folding' portion of the platform. The folding platform along the track is used to allow wide freight trains access past the station. When the station originally opened in 1982, Conrail (predecessor to CSX) needed the ability to transport wide loads to Boston and the Beacon Park freight yard. What is a wide load? As described in this blog post, wide loads are most frequently electrical transformers around here, although out west they ship airplane fuselages by train (unless they fall into a river (please click that link, you won't be disappointed)). The ability to fold out of the way is the reason that the edge of the platform sometimes feels 'bouncy' on mini-high platforms. The delay in rebuilding these mini-high platforms appears to be related to the normal capital planning process along with the potential that the work would trigger ADA (Americans With Disabilities) requirements. 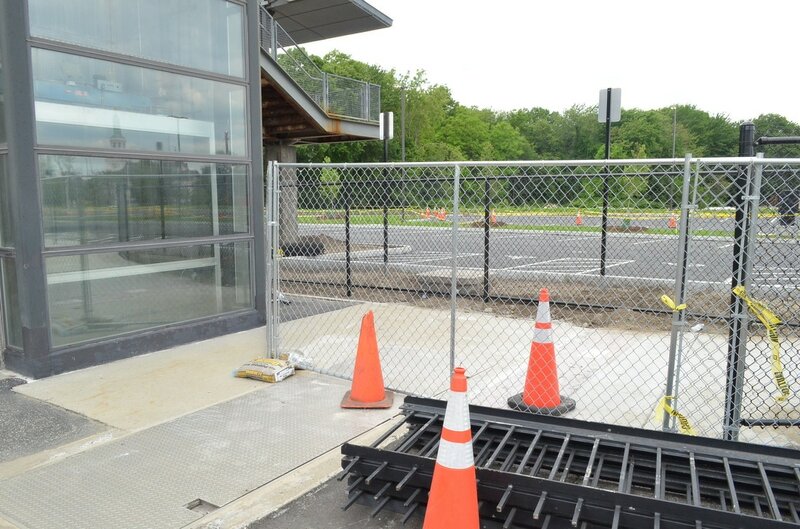 For any stations that are not 100% handicapped accessible, any construction work that exceeds 30% of the assessed value of the station triggers full ADA compliance. 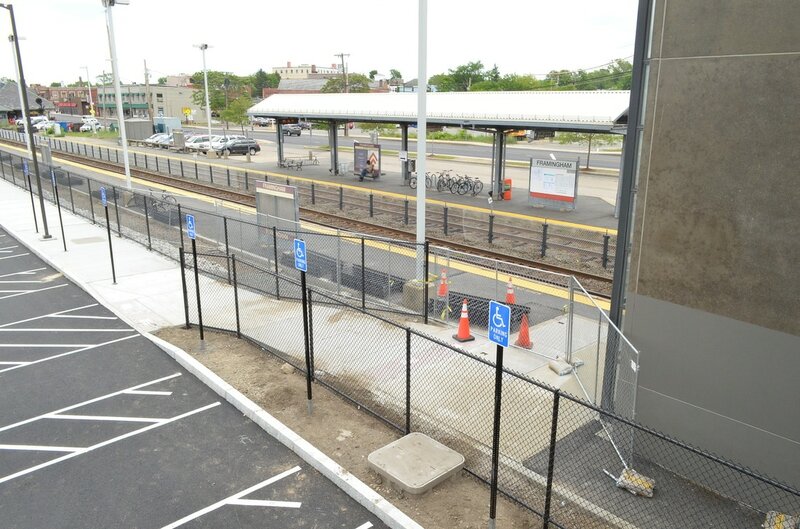 Full ADA compliance at commuter rail stations means full length high platforms - similar to Boston Landing or Yawkey, with fully accessible paths from the surrounding area to both platforms. It's possible that with such a simple station as West Natick, constructing new mini-high platforms would exceed this 30% threshold. This would force the MBTA to do nothing or build full length high platforms - a substantial and complicated capital project for West Natick, since the 'grade crossing' walkway across the tracks to the track 1 platform would need to be replaced with a bridge with elevators. That ain't cheap. As you can see, this is an odd glitch in the ADA requirement. The effect is to force the MBTA to avoid repairing the mini-high platforms so they don't trigger the 30% threshold. Obviously they should just build full length high platforms, but the capital budget isn't unlimited. I have heard rumors that the MBTA was negotiating with the relevant authorities for some relief from the ADA requirements so they could implement logical repairs such as West Natick without having to trigger the complete rebuild of stations. This makes sense, since without that relief the MBTA would be forced to make no repairs to the mini-high platforms. Even if they were going to build a full length high platform station, the planning, design, permitting, and construction of that would take years - so allowing them to repair the mini-high makes sense in that context also. As some of you have noticed, the existing mini-high platforms have been demolished. The current plan is to replace them with construction scheduled for June. I don't have details regarding if this is part of an agreement or waiver for the ADA requirements or if that was even a factor. But the good news is they are finally getting fixed! It will be interesting to see if the rebuilt platforms include folding platforms for wide freight trains or if they construct fixed platforms. I have been told that CSX has waived their rights to take wide freight loads east of Framingham. With the closure of the Beacon Park freight yard, the only scheduled freight service east of Framingham is tank cars to the Houghton Chemical facility in Allston & boxcars to a produce warehouse in Everett. Neither of these customers require wide freight cars, and there are no facilities for 'special' loads to be delivered via the Framingham-Worcester line to Boston. Eliminating the folding platform would allow for the construction of a fixed platform, which is much easier to maintain and less susceptible to failure. If I get more information, I'll edit this blog post. We're into the final stretch of the tie replacement and railbed resurfacing project. Work on track 2 from mile 14 to mile 28 will commence on Monday April 3 and should be complete in early June. Many of you may have noticed that they have already staged bundles of new ties alongside track 2 on this stretch. Track 2 is the southernmost track and the track that both inbound and outbound trains use between Framingham & Boston (why? see this blog post). 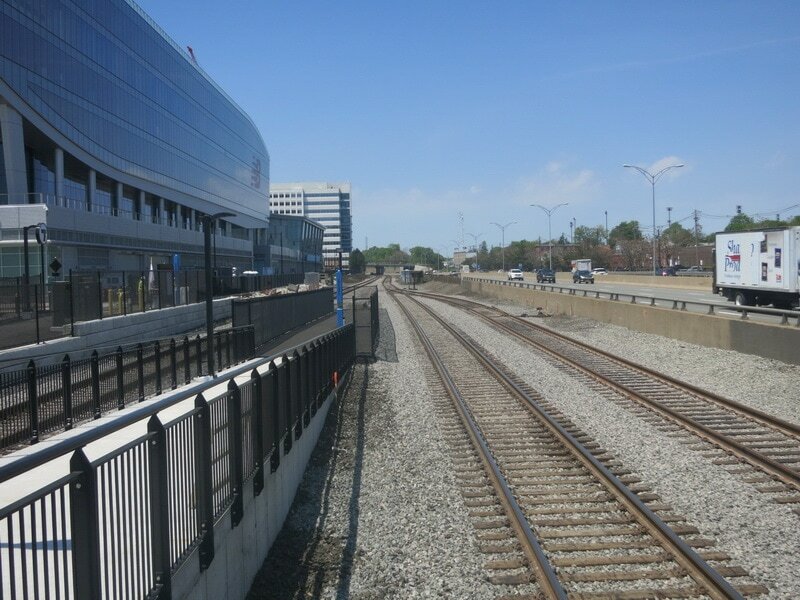 The tie replacement project has been completed on all other sections of the line: the entire length of track 1 (except directly within Framingham station), from Boston to mile 14 on track 2, and from mile 28 to Worcester on track 2. Mile 14 is between Wellesley Hills and Wellesley Square, while mile 28 is between Southboro and Westboro. You can see the exact locations of each mile marker on this awesome mapping website. Therefore the project limits are from Southboro to Wellesley. This project also includes both tracks directly within Framingham station. This blog post explains the entire process of tie replacement, including the innovation of using a track stabilizer to minimize the length of track where a speed restriction needs to be applied. The benefit of the track stabilizer to help keep the rush hour commutes moving without excessive delay can't be overstated. Construction is necessary, but the MBTA truly is doing what they can to minimize the inconvenience for us. Take a look at that blog post - I won't regurgitate it here, but it's still completely applicable. 2) Change to the schedule of P512 to avoid a en-route delay at Framingham. The mid-day delays of 5-15 minutes are understandable as trains may need to operate at reduced speed near the construction workers. 9:19 AM: outbound P507 at Wellesley Farms on track 1. 9:21 AM: inbound P512 at Framingham on track 2. 9:39 AM: outbound P507 at Framingham on track 1. 9:43 AM: inbound P512 at Wellesley Farms on track 2. So from about 9:20 AM to 9:40 AM, both tracks are needed for the regular schedule between Framingham and Wellesley. This is actually the last time until the evening commute that both tracks are needed along this stretch. Mid-day train trips are sequenced such that only one train is travelling in either direction on this stretch. That's another good thing in the context of this tie replacement project since this means that those mid-day trains only see minor delays and no trains have to be completely cancelled. The construction work does not start until after the AM rush hour in order to avoid delaying the high ridership commuter trains. P512 is the just outside the defined "AM rush hour" and therefore is subject to the mid-day construction delays. The construction crews move onto the tracks as soon as inbound P586 clears past them, which is anywhere from 8:40 AM to 9:20 AM, depending on where they are staged. With only one track available between Framingham and Wellesley after 9 AM, it's impossible to have P507 & P512 on that stretch at the same time. By delaying P512 so that it essentially 'waits' for P507 to get to Framingham, P512 can then proceed past Framingham and occupy track 1 where P507 had just been occupying. There's the 20 minute delay - instead of departing Framingham at 9:19 AM as per the published schedule, it departs at 9:39 after P507 has passed by. Keeping P507 on time allows P514 to operate on time - if P507 were delayed for 20 minutes, then a delay would cascade to P514 (which uses the equipment from P507). The delay to P512 actually happened frequently in the early summer of 2016 - but P512 would depart Worcester on time and then sit at Framingham for 20 minutes with an announcement about the delay once the train arrived in Framingham. Proactively announcing this delay now and holding the train in Worcester for 20 minutes seems to be a better solution - passengers will be able to plan ahead and change their schedule if needed. In the past I had advocated for the delay to be applied to P507, even if that delayed P514, since ridership on P512 is higher than P507 (and P514). As documented in this blog post, they implemented my suggestion in July of 2016. I'm not sure why they didn't consider it now. I'll suggest it again. 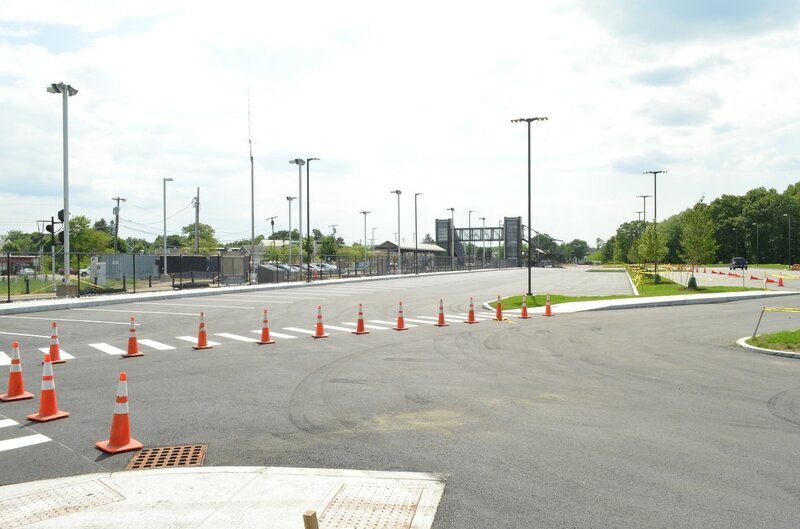 Construction is just resuming on the new parking lot in the 'infield' of the CSX North Yard east and west wye tracks. Governor Baker presided over a groundbreaking ceremony for this project back in October of 2016. Those statistics do not include the lot on the south side of the station (adjacent to Route 135) since no changes are being made to that side. I've been told that the existing walkway across the freight track adjacent to the banana lot (actually called the "station track" by CSX) will be closed. 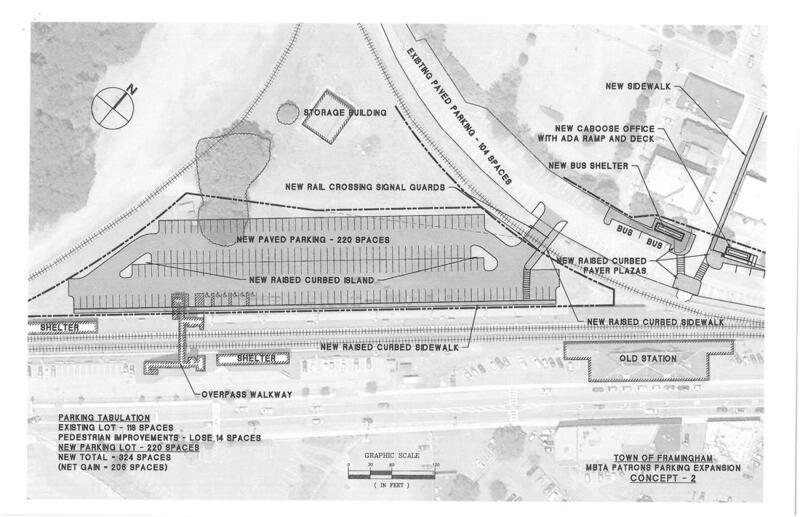 People parking in the banana lot will have to walk across the freight track at the entrance to the new parking lot and walk through the parking lot (along a sidewalk) to the pedestrian bridge (where a new access point through the fence will be made). 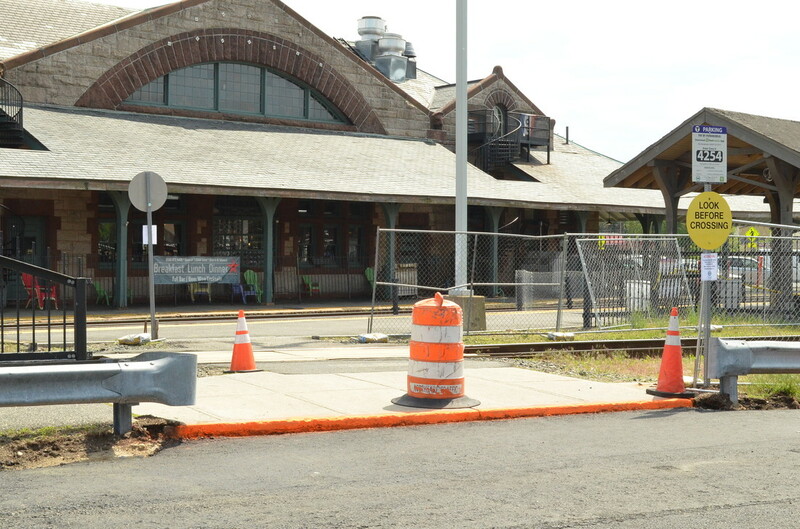 This will eliminate access to the easy but dangerous and illegal path that people use to cut across the main line tracks right near the old station building (now the Deluxe Depot Diner). Construction is estimated to take "a couple more months." In other Framingham parking news, the MWRTA is now enforcing the overnight parking ban for the train station parking lots. On a number of occasions this winter, cars were left in the lots overnight during snowstorms, preventing proper and complete snow removal. Also, the MWRTA is interested in our feedback about the Framingham station and parking since they took over a few months ago. Send them an e-mail at parking@mwrta.com and/or leave a comment below. The current proposal to "suspend" weekend MBTA Commuter Rail service is the extreme endpoint of a game that has been played for many years with the finances of the MBTA. A "draconian service cut" such as this has been predicted since at least 2009 - and maybe it's surprising that it took so long to finally get here. 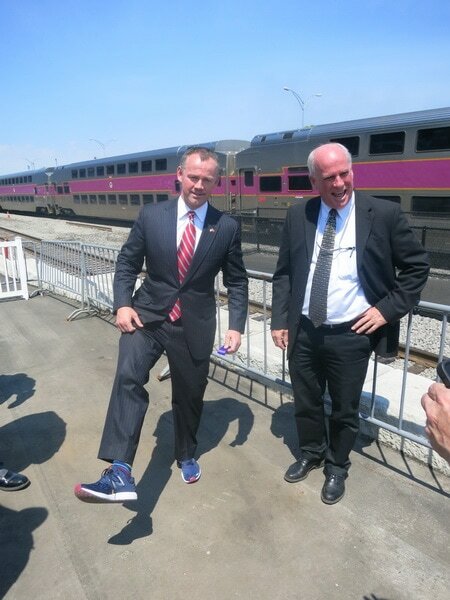 The basic problem is the mandate that the MBTA balance its budget. Although that sounds reasonable, the devil is in the details. And the details in this case are a sudden reallocation of additional state assistance towards capital projects rather than to offset legacy debt costs. In 2015, Governor Baker's own "Special Panel" recommended using $187 million of additional state funding to help the MBTA balance their budget. The latest budget proposal from the MBTA still asks for $187 million of additional state funding - but now that money won't go to operations (and debt service) but rather to capital improvements. Without that money in the operations budget, the MBTA has to cut costs in order to balance the budget. Eliminating weekend Commuter Rail service and expanded "Ride" services are two of the biggest line items being cut to balance the budget - and supposedly "allow" the $187 million to go towards capital improvements and not operations. The solution is obvious: take some of that $187 million and put it back into the operating budget. Only $17 million of the $187 million is needed in order to save both weekend Commuter Rail service AND the expanded Ride services! THIS SOLUTION DOES NOT REQUIRE ANY ADDITIONAL FUNDING FROM THE STATE. It simply reallocates state budget money already being earmarked for the MBTA. Skip down to the end of this blog post for the details on how you can help to make this happen. As described in the aptly titled "Born Broke" report from 2009, when the "Forward Funding" law was enacted in 2000 the MBTA was burdened with $3.3 billion in debt. Much of that debt was related to the Big Dig - and that debt is even called out in the recent presentation regarding the budget (see page 48 here). The law also required that the MBTA balance its budget using "own source revenue" (like fares, advertising, etc.) and a fixed share of the state sales tax. In many fiscal years, that hasn't worked out, and the state has had to allocate additional funding beyond those sources in order for the MBTA to balance their budget. The conclusion of the Born Broke report sums up the situation both then and now: "The underperformance of the sales tax as a principal financing source and too much debt are the causes of the T’s structural weaknesses. Until these factors are addressed, no amount of reorganization, efficiencies, or reforms will allow prevent deficits in FY10 or in the future." Hence the prediction in the Executive Summary of the Born Broke report that "without external assistance in the form of debt relief or new revenue the Authority will be forced to make draconian service cuts and impose dramatic fare increases." We've already seen the dramatic fare increases. With the loss of the previous 'external assistance,' we're now on to the draconian service cuts. The oft-cited D'Alessandro Report​ from November 2009 reaches much of the same conclusions. Those reports are from quite a few years ago, what about now? For many of the intervening years since "Forward Funding" was enacted in 2000 (both prior to and after 2009), the MBTA has been able to cobble together enough 'reforms,' revenue increases (fare hikes), and additional state funding to avoid drastic service changes. Some of those reforms - especially recent reforms - have been wholly positive and beneficial. These include the investigation and move to improve the parking revenue stream and the restructuring of debt in a fiscally responsible way (see page 8 here) among others. Other attempts, especially in the early to mid-2000's, were essentially shell games to keep the budget balanced while avoiding the larger real issues. Many reforms have been controversial - privatization of the 'cash room' and other services. Other reforms haven't made the headlines, but have affected many - "30% reduction in Corporate Headquarters/Administrative positions" (see page 14 here) for example (and then we wonder how designs like Auburndale slip through?). In April 2015, Governor Baker commissioned a Special Panel to investigate the MBTA - primarily as a direct result of the disastrous winter of 2015. The report that was produced explicitly "rejects the ‘reform vs. revenue’ debate because the MBTA needs both." Most of their proposed solutions were implemented - the Fiscal and Management Control Board was implemented as a result of the report. That report also laid the groundwork for the fare increase in July 2016. However, one of their recommendations that wasn't implemented was that the Legislature should "Limit future General Fund operating assistance by purpose to cover (1) debt service payments (2) employee costs for staff moving off of the capital budget." Allow me to summarize that slide in one phrase: The State should take back the legacy and Big Dig debt from the MBTA. That would allow the MBTA to implement the goals of "Forward Funding" without the weight of that debt dragging the T's budget down. Doesn't that sound familiar? IT'S THE SAME CONCEPT RECOMMENDED IN BOTH 2009 REPORTS. That's from page 15 of the presentation - I've added the highlighting. 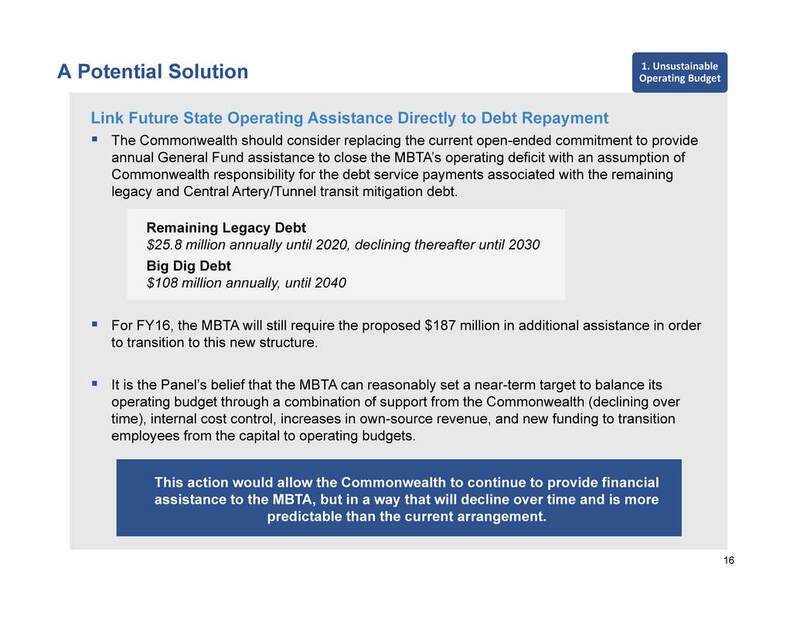 Although it is an admirable goal to set aside funding for capital improvements, reallocating the additional state assistance away from the operating budget means that SOMEBODY STILL HAS TO PAY THE BILLS - the "bills" being the debt service on the mountain of debt that the MBTA carries. This is all backdrop to where we find ourselves today. The MBTA has set this goal of being able to balance the budget without using the $187 million towards operating expenses. How do they do they do that? The same way you balance your budget at home: reduce expenses. So forget everything you're reading about operating subsides, ridership counts, and other factors related to weekend Commuter Rail Service. Elimination of weekend Commuter Rail service is intended to do one thing only: scrape up some cash to balance the budget and to make it appear that the $187 million in additional state assistance can be removed from the operating budget and allocated to capital improvements. Remember, capital expenses (building stations, the Green Line Extension, the purchase of red and orange line subway cars, etc.) are NOT part of the operating budget. The operating budget pays for operations - bus drivers, subway operators, and the Keolis subcontract among other things. So don't get confused when you hear that the MBTA isn't spending enough capital - they actually aren't spending all that they could in terms of capital funding. Some of that is due to the delay in the Green Line extension, but capital spending is a story for a different day (see slide 17 here if you want details on the capital spending problem). 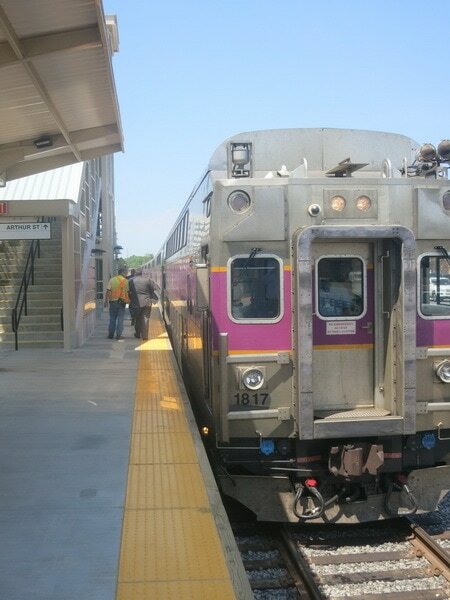 Keolis, as the private operator of the Commuter Rail, has a contract to perform a service. As part of the contractual arrangement, they are paid on a monthly basis for the work performed. If the level of service that they are required to perform changes (for example, more or less trains on a schedule), then their compensation would change. This is an important fact that many folks don't understand. The MBTA sets the service level and implements policies. Keolis is essentially obligated to do what the MBTA tells them to do. Clearly they have nothing to do with the proposal to eliminate weekend service - it would reduce the payments they get! Every penny of every fare collected by Keolis goes directly to the MBTA. Keolis does not 'keep' any of the revenue they collect - they are paid separately by the MBTA. Again, there are probably plenty of people who think that the compensation for Keolis is somehow tied to the fares collected. It just simply isn't true. The value of the payments to Keolis are independent of the value of the fares collected. Saving $10 million while cancelling 104 days of service doesn't seem like a great bargain because it isn't. The problem is that the only savings that can be recognized are the small incremental staff and fuel costs for weekend service. The other costs - rolling stock, infrastructure, and maintenance aren't affected enough by the reduction in weekend service. The rails and fleet of equipment still need to be maintained, and the reduction in 'wear and tear' isn't enough to change the price that the MBTA is paying for those long-term services. Fine, just please tell me why Weekend Service is being cut! 2) Lower revenue from weekend fare collection. In other words, if you stop going out to dinner every weekend, you'll save the money that you would usually be paying the restaurant. But there is an offsetting cost - you still need to eat, so the cost of food that you're cooking at home offsets the savings. The savings CAN'T be the total of your restaurant bills. Same for Commuter Rail - there won't be any cost for running the trains on the weekend, but there also won't be any fares being collected. There has been no explanation of how they are calculating the $10 million value - and we need it. That slide is a little confusing, but read it from right to left. 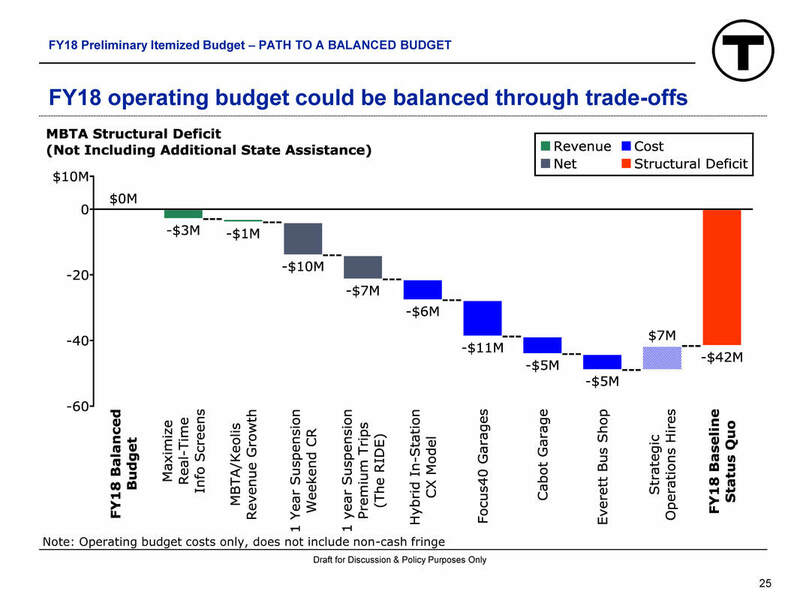 Without any changes, and assuming the $187 million of additional state assistance does NOT go to the operating budget, then the MBTA predicts that they will have a $42 million structural deficit. On top of that $42 million deficit, they want to spend $7 million on strategic operations hires (why are they needed? see: Auburndale). That means that they have to find $49 million in cost reductions or additional revenue to get to a balanced budget. Each column on that chart represents an incremental move from the total $49 million deficit towards the balanced budget on the left. 1) With the MBTA typically not spending all of their capital funding, the $187 million allocated to the MBTA under this budget proposal could easily be 'taken back' towards the end of the fiscal year if it is unspent. That could help the administration balance the overall state budget if needed. Another shell game with MBTA money. 2) The idea of using the $187 million towards capital improvements allows the administration to claim that they are 'investing in the MBTA.' But it avoids what the 2015 Special Panel found was the REAL solution: Balance the MBTA budget with the $187 million of additional state assistance to the operating budget AND find NEW sources of ADDITIONAL REVENUE to provide the MBTA with funding for capital projects. Another shell game with MBTA money. 3) Highlighting the "subsidy" that is needed for various weekend Commuter Rail trips is not a valid measurement of the savings that can be achieved. Those "subsidy" values include a percentage of the fixed cost of the Commuter Rail network, which, as noted above, isn't a fair way to calculate the savings. Steve Koczela does the math that matters in this tweet and shows that the actual savings averages out to $6.24 per weekend rider. The MBTA presentation of subsidies that aren't real is another shell game with MBTA money. 4) Reform before revenue has failed. Every report that has been commissioned to look at the MBTA - including Governor Baker's own 2015 Special Panel - has reached the conclusion that the MBTA needs both reform AND revenue. As noted above, some of the recent reforms have been good - and some of the controversial and/or painful reforms are probably also good. But the idea that the MBTA can continue to balance their budget without new revenue AND avoid draconian service cuts has finally been proven false. Another shell game with MBTA money. This is where it becomes very simple. If you want a world class transit system that isn't the only major Commuter Rail system that shuts down on the weekend, then DEMAND IT. Remember that the MBTA is not a completely independent state agency. Clearly the MBTA didn't come up with this budget proposal that includes the idea of moving the $187 million around without participation from the corner office in the State House. So calling the MBTA isn't really what needs to happen. 1) Stop playing shell games with the MBTA budget. 2) Allocate at least some of the $187 million back to the operating budget so that weekend service and the Ride can be preserved. 3) Actually, allocate the full $187 million back to the operating budget so the MBTA can restore operations staff and systems to where they need to be while paying down more of the legacy and Big Dig debt. 4) Find new additional revenue sources for capital improvements for the MBTA, as recommended by Governor Baker's Special Panel in 2015. Use this link to find the phone numbers for your legislator. Changing the Heart to Hub train to times that align with a 9-5 workday in Boston (as recently requested by Worcester politicians) will devastate the schedule for the non-Worcester ridership of the Framingham-Worcester line. It's just not possible with the current infrastructure that we have. Recently, Worcester Mayor Joseph Petty sent a letter to the MBTA requesting that the times of the Heart To Hub train be changed to be better aligned with a 9-5 workday and that no stops be added to the train. While these might be reasonable requests that would add value to MBTA Commuter Rail passengers from the Worcester area, those requests need to be considered in the context of the entire Framingham-Worcester line ridership. The Heart to Hub train also stops at Yawkey and Back Bay but currently does not stop at any other station between Yawkey and Worcester. The Heart to Hub train was originally announced in October 2015 and was added to the schedule in May 2016. There are many blog posts here about the Heart to Hub train and they can all be found using the "Heart to Hub" category link for this blog. Clearly neither the current nor the proposed times for the Heart to Hub train are ideal for the vast majority of commuters working a 'typical' 9:00 AM to 5:00 PM (or close) workday in Boston. In that context, the request by the Worcester politicians seems to make sense. But the solution - a schedule that answers this request - is fraught with problems. In order to demonstrate the problems with a modified schedule for the Heart to Hub train, I have developed a hypothetical schedule with the Heart to Hub train at a 'more desirable' time. For simplicity, I have only modeled the evening commute, but the morning commute has similar problems. 1) Minimum of 10 minutes between departures from South Station. 2) Minimum of 12 minutes between any trains arriving at Framingham. 3) Minimum of 30 minutes between trains arriving at Worcester. ​The reasons for these constraints are explained at the bottom of this blog post. 2) All local trains terminate at Framingham and make all stops between Boston and Framingham. These rules (and common sense) dictate that a local train can depart close behind an express train - but not the other way around. It is impossible to have a local train depart just before an express train - the local train would block the track! NOTE: I am NOT proposing that the outbound Heart to Hub train stop in Framingham. I have included the time that it PASSES THROUGH Framingham because that is a constraint in scheduling it. Hence the italicized "strikethrough" for that time - it is NOT A STOP, but that time is the approximate time the train passes through Framingham. 1) I aimed to have the Heart To Hub depart Boston at a 'reasonable' time for a worker leaving their office at 5 PM. Assigning a departure time of 5:10 PM seemed to be reasonable to account for walking to the station. It also allowed me to keep the three earlier trains (3:30 PM, 4:20 PM, and 4:30 PM departures) at the same times as they are proposed on the May 2017 draft schedule. c) It arrives in Worcester 31 minutes after the previous train. e) if the 4:30 PM local train departed later, the Heart to Hub train could possibly 'catch up' to it somewhere prior to Framingham (although I will acknowledge that the 4:30 PM local train could probably move 5-10 minutes later). 3) For the remainder of the schedule, I kept the total number of outbound rush hour trips at 10, which is the same as what is proposed on the May 2017 draft schedule for the PM rush hour PLUS the Heart to Hub. c) It arrives in Worcester 29 minutes after the Heart to Hub train. c) Worcester is not a factor since it terminates in Framingham. c) It arrives at Worcester 38 minutes after the previous train. 7) The 6:10 PM, 6:40 PM, and 6:50 PM departures from South Station follow the same pattern established for the 5:20 PM, 5:30 PM, and 6:00 PM departures from South Station. The above hypothetical schedule for Heart To Hub passengers probably looks great if you want to get to Worcester after leaving your office at 5 PM. So where's the problem? First, let's take a look at the draft schedule proposed for May 2017. 1) Passengers on P521 (the 5:00 PM express) have their commute pushed 20 minutes later. This train is the most popular train in the evening commute and carries an approximate passenger load of 1,400 passengers. For simplicity's sake, let's assume that those 1400 passengers are evenly distributed to all 7 destinations (which is NOT a valid assumption - data shows that Framingham and West Natick have much higher ridership than other stations). This assumption means that approximately 200 passengers are destined for Worcester - and those passengers would benefit from the new Heart to Hub times. BUT THE OTHER 1,200 PASSENGERS WOULD BE DELAYED 20 MINUTES. Even if you try to stretch the ridership count at Worcester to assume that Worcester has a disproportionate share of the ridership or assume that some Grafton passengers would drive to Worcester to take advantage of the Heart to Hub, there still is over one thousand passengers going to the other stations. 2) Passengers on P593, (the 5:10 PM local) have their commute pushed 20 minutes later. This train is the most popular local train in the evening commute and carries an approximate passenger load of 630 passengers. None of these passengers are destined for Worcester, so ALL 630 PASSENGERS WOULD BE DELAYED 20 MINUTES. That is a total of approximately 1,800 passengers that have had their commute made 20 minutes later. That far exceeds the TOTAL number of passengers using Worcester Station for their commute. 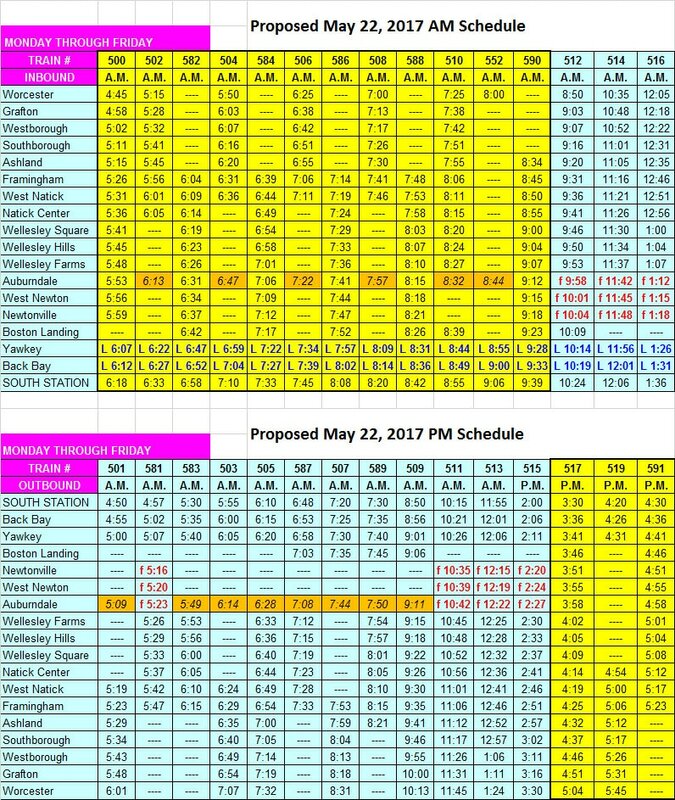 3) With the hypothetical schedule above, there is a ONE HOUR GAP IN SERVICE FOR ALL STATIONS (except West Natick and Framingham). For example, if you want to go to Wellesley Square, you can only arrive there at 5:08 PM or 6:09 PM. Similarly, if you are destined to Westborough, you can only arrive there at 5:25 PM or 6:26 PM. This is at the height of the rush hour. The proposed May 2017 schedule has trains arriving at those stations every 40 minutes during the same period. This gap in service is a logical consequence of a super express train - the track needs to be clear so that the Heart to Hub can speed through directly to Worcester. 4) The modified arrival times for the 1,800 passengers delayed 20 minutes could have serious consequences for those passengers. During many recent public comment periods, passengers have noted that many after-school child care facilities close at 6 PM. 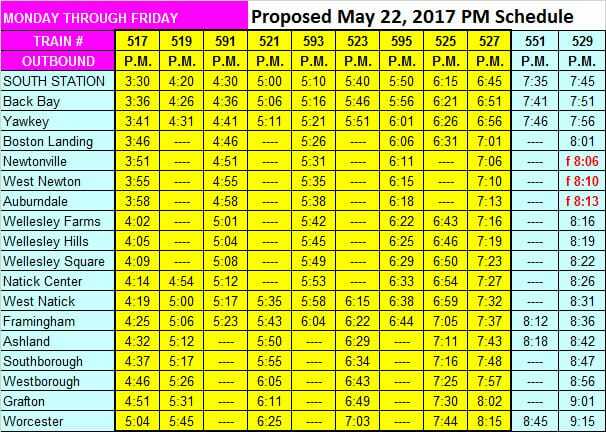 On the current and proposed May 2017 schedule, passengers leaving work around 5 PM can get to their destination with enough time for child care pickup before 6 PM at all stations between Boston and Framingham (Ashland is too close for my comfort - but maybe some passengers try to do it). The hypothetical ideal Heart to Hub schedule prevents anyone from arriving at their destination with enough time to get somewhere else by 6 PM if they leave work around 5 PM. 5) The ~5 PM express train and ~5:15 local train have existed for at least 15 years. Many passengers have built their daily commute / work / life schedules based on these train times, and disrupting that schedule could inconvenience them or push them away from the Commuter Rail. I'm not normally a fan of doing something because "that's the way it's always been done," but when it comes to schedules such as these, there should be some deference given to historical precedent. Changing the time of the Heart to Hub train to be "better" for Worcester bound passengers leaving their offices at 5 PM clearly presents too many insurmountable problems for passengers from every other station on the line. That's why it can't happen with the current infrastructure on the line. 1) A second platform at Worcester Station and/or improved track layouts around Worcester. Once you start playing with the schedule, you quickly realize that the limitation of a minimum of 30 minutes between arriving trains at Worcester really handicaps any kind of creative scheduling. Eliminating that constraint by adding a second platform or reconfiguring the track layouts could eliminate or change that constraint, which could allow for better scheduling options. See footnote #3 below about Worcester station. 2) Upgrade the speed limit on the line (or sections of the line). Speed limits on a railroad are governed by many factors: track bed and rail conditions, track geometry (it's considered bad form for trains to go flying off of curves at high speeds), signal spacing, and safety considerations (density of grade crossings). Some of those constraints can't be corrected - the curvature of the track can't be changed without realigning entire sections of the railroad, which would most likely be impossible in the densely developed area around the Framingham-Worcester line. But some sections of track are straight or nearly straight, and those sections could have the speed limit changed. That might require upgrading the track bed and/or modifying the signal system, but those are changes which can be done. 3) Install a passing track somewhere on the line. In years past, the schedule included "leapfrog" moves where an express train would pass a local train - while both were travelling in the same direction. With only two tracks between Boston and Worcester, this required opposing traffic to be scheduled so that it would not conflict with the leapfrog moves. This resulted in very tight timing of the schedules for moving trains back and forth. Any upset or delay to the schedule would quickly cascade to multiple trains. Recent schedules have eliminated the "leapfrog" moves, since they introduced an unacceptable risk of cascading delays. I believe this is the correct answer given the infrastructure we have. Adding a passing track (or two!) somewhere between Boston and Framingham would allow these "leapfrog" moves to be added back to the schedule. The real estate exists for additional tracks between Weston and Framingham - this section once had four tracks. Most bridge abutments accommodate four tracks, although most station platforms would need to be rebuilt. The ideal configuration would be to put the passing track(s) between the outer "local" service tracks, although having the local tracks in the middle serviced by center island platforms with the express tracks on the outside could also work. Adding a passing track would allow the Heart to Hub train to move past trains making station stops - reducing or eliminating the long gaps in service for those stations while the track is kept clear for the Heart to Hub with the current infrastructure. 4) Installing high level platforms. Dwell time is the time a train spends in a station while passengers embark or disembark. Dwell time is a large factor in the overall duration of a train's trip. As ridership increases, dwell times increase - add 30 seconds of dwell time at 6 stations and you've added 3 minutes to the duration of a trip. High level platforms - where passengers step directly onto the train rather than needing to climb the stairs on the train from the platform into the train vestibule - dramatically reduce dwell time. Not only can passengers board more quickly (climbing stairs is slow), but ALL of the doors of a train can be remotely opened and closed (like a subway car) allowing MORE passengers to board at the same time. 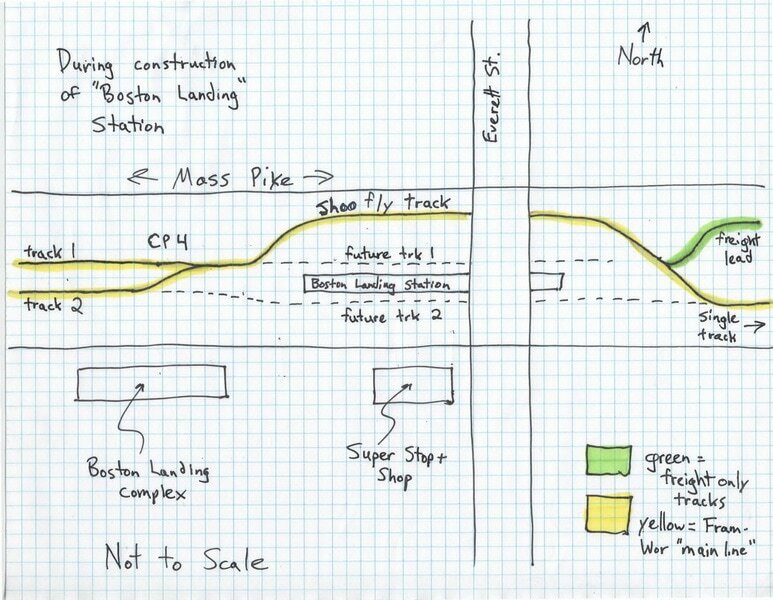 Both Yawkey and South Station have high level platforms for the entire length of every platform - and the soon to open Boston Landing station will also have full length high level platforms. But every other station (including Back Bay) has either all low level platforms or a combination of low level platforms and a "mini-high" platform that offers some handicapped accessibility. Constructing high level platforms at every station would be expensive - but they don't all need to be done at once. Changing the highest ridership stations to high level platforms (especially Back Bay) would be money well spent. 5) Electrification. Now we're talking about very long term but very beneficial capital investment. Electric powered trains offer many advantages over the diesel locomotive trains that the MBTA now uses but the most relevant for this discussion is the quicker acceleration and deceleration (stopping time). Electric trains would decrease the overall duration of every trip - and would be compatible with the proposed North-South Rail Link tunnel through Boston. 6) Stop getting hung up on the marketing buzz of "one hour Worcester to Boston" (which isn't even true anyway). Obviously everyone wants a direct train from their station to Boston at the most convenient time for them. With only two tracks, it just isn't possible. So instead of trying to promote service that benefits one station at the expense of other stations, why not just focus on the really good express train service that Worcester DOES HAVE regardless of the Heart to Hub? Why not add more express trains (that stop at all stations from Framingham to Worcester) paired with local trains so nobody loses service but everyone gets better service? Hopefully Worcester residents and politicians will understand that a more comprehensive and collaborative approach to the Framingham-Worcester Commuter Rail line schedule will result in benefits for everyone. That's more productive than pitting the ridership from one station against the ridership from other stations in an unwinnable civil war. Let's work together to make Commuter Rail great again! 1) Minimum of 10 minutes between departures from South Station. 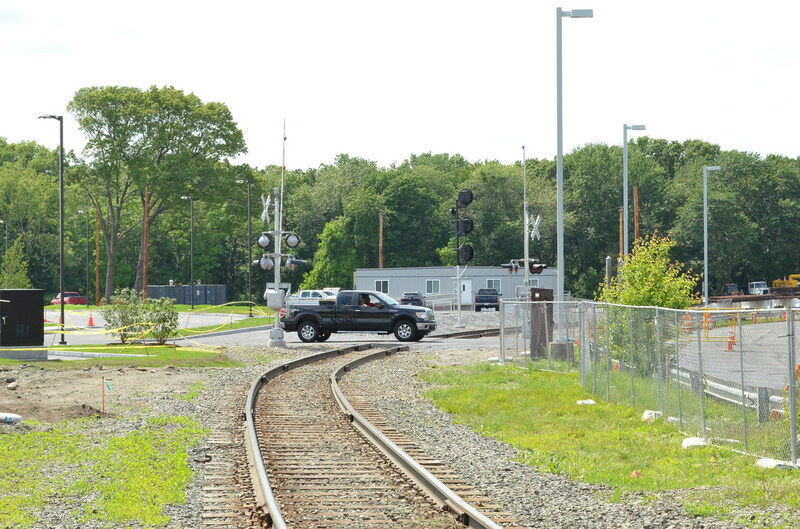 The block signalling system effectively requires about 8 minutes between trains on the Framingham-Worcester line so that a train behind another train can proceed on 'clear' signals. Rounding that up to 10 minutes allows for some contingency. For a more comprehensive explanation of block signalling, see "Automatic Block Signal System" in the Glossary. Watch the corny little video linked from that definition. 2) Minimum of 12 minutes between any trains arriving at Framingham. Again, this is due to the block signalling system. At Framingham, the signals and switches are densely spaced, which is a good thing - lots of options and room for trains to go to different tracks and get out of the way. So why 12 minutes instead of 8 or 10? Framingham is 21 track miles from Boston - and trains making station stops or just travelling over those 21 miles have more opportunities to encounter minor delays. Moving the spacing to every 12 minutes at Framingham allows for some contingency and reduces the chances of delays for a following train. This constraint actually doesn't come into play very much since the first and last constraints effectively govern the schedule. 3) Minimum of 30 minutes between trains arriving at Worcester. Worcester Union Station is served by a single platform on a siding track off the main line. This track is effectively a dead end for the MBTA - the track past Worcester station is owned and dispatched by CSX - and movements by MBTA / Keolis trains onto CSX property are complicated and difficult. In addition, the storage yard for MBTA trains is EAST of Worcester station. This means that after a train arriving at Worcester is unloaded of passengers, it has to reverse direction and move towards Boston then reverse direction AGAIN and move into the storage yard - all the while, blocking access into the station for any other train. The switch and track configuration in this area does not allow for parallel train movements or train movements around the storage track "entrance." As discussed in this blog post below, the next phases in the roll out of the new May 22, 2017 schedule are the public hearings and the associated public comment period. The official MBTA web page with details on the public hearings is here. The official 'reveal' of the new schedule is on this MBTA web page. There were no major changes to the draft schedule that I published back on December 16, EXCEPT that inbound train P520 was moved 5 minutes later. There were some other minor time tweaks, but no changes at all to any rush hour trains. I updated my PDF of the proposed schedule so that it includes all the changes. Please make sure to fill out this survey and add your comments. That is the only way to get your written comments on the "official" record - tweets and comments written here will NOT become part of the official record. But the best way to get your comments on the record will be to come to one of the public hearings! I hope to be able to get to some of them, so I'm looking forward to meeting more of my blog and Twitter followers. Finally, the MBTA published a helpful comparison table to compare the existing schedule to the proposed schedule for service from each station to and from selected destinations. 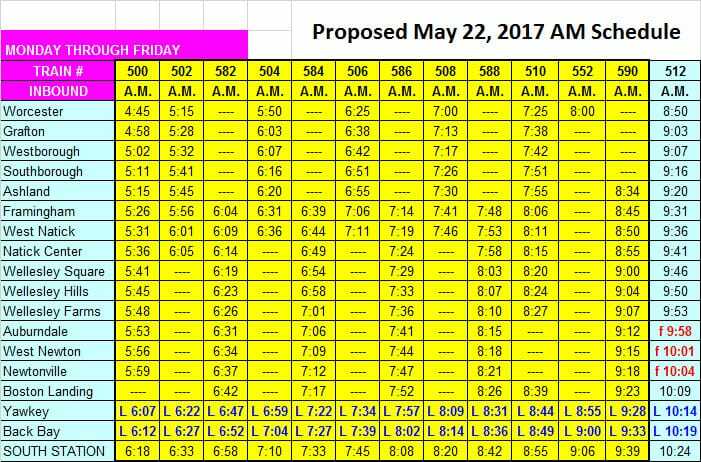 On December 1, 2016, this blog post provided a preview of the draft morning Framingham-Worcester weekday schedule to be implemented on May 22, 2017. The entire weekday schedule is now available. The schedule is shown in the three images below - the entire schedule plus 'zoomed in' images of the AM and PM rush hour service. Click on any of the images below for a PDF of the entire schedule. There have been a couple of changes to the morning schedule between December 1 and now, which are outlined below. My entire commentary from the previous blog post is also provided here, just for continuity. a) This is the final draft developed as a result of the Worcester Line Working Group meetings. There might be some minor tweaks to some times as the MBTA completes simulations of the 'runs' over the next few weeks but the concepts shouldn't change - there won't be any stops added to or taken away from particular trains, locals and expresses will stay where they are, and trains won't be shuffled around before the final draft schedule is published by the MBTA. b) The intent is that in a few weeks, this draft / proposed new schedule will be formally published by the MBTA. That will be followed by a formal public comment process. More on that below. c) This is only a PROPOSED schedule, and the public comment process may result in changes being made before it is implemented in May 2017. There is no way to predict if those changes could be substantial or not. 2) Publication of this draft: All members of the Working Group agreed that this draft schedule could be published here on my blog to offer everyone a 'sneak preview' before it gets published officially by the MBTA and the public comment period starts. So if you see something you hate, don't get too fired up yet - remember, this isn't cast in stone. b) P510 stops at Natick Center & 3 Wellesley stations. 3a) Heart to Hub: How did they keep the Heart to Hub? Easy - we're getting another train set. Currently, the AM peak service is serviced by eight train sets. With the addition of another set to increase the number of sets assigned to nine, the Heart To Hub can stay on the schedule. Or another way to look at it is new train P586 (7:14 AM departure from Framingham) can be added to the schedule with the ninth set. P500 goes back out to Framingham and is 're-used' as new P586. P502 goes back out to Framingham and is 're-used' as new P588. ​P504 goes back out to Framingham and is 're-used' as new P590. As previously noted on other blog posts, 4 train sets start the day in Worcester after spending the night in the layover yard. The other 5 sets come from storage in Boston. a) Off-site overhaul of 10 existing out-of-service locomotives. The request for proposals for this project was recently published and bids are due in mid-December. b) Overhaul of additional out-of-service locomotives by Keolis and other local repair facilities. c) Off-site execution of 4-year inspections for 19 coaches which have been out-of-service awaiting those inspections. This work will be done in Delaware by a railcar maintenance company. When complete, these tasks will result in growth of the overall fleet size for the South Side Commuter Rail operations - allowing us to get a ninth set and allowing everyone to benefit from better equipment availability. 3b) P510 at Natick Center & 3 Wellesley stations: My original proposed schedule converted P510 to an express train with similar service as the other express trains - express from West Natick to Yawkey. However, it was pointed out that Natick Center and the 3 Wellesley stations have had inbound service with stops in the 8:20 to 8:30 AM time frame for many years. I went back and checked and it's true - the ~7:30 AM departure from Worcester making all stops to Wellesley Farms has been on the schedule for at least 16 YEARS. So there is something to be said about not removing long-established service that people have built their routine around. From a purely schedule fairness perspective, I'm not thrilled that these 4 stations end up with better service than any other stations, but keeping those 4 stations on the P510 schedule only adds 8 minutes to the duration of P510. 4) Boston Landing: Adding Boston Landing to the local Framingham-originating trains actually allows everyone to get to Boston Landing relatively easily without adding more time to the duration of the express trains. For anyone west of Framingham wishing to go to Boston Landing, they can de-board in Framingham and transfer to the next inbound local train. Each Framingham-originating local departs Framingham only about 8 minutes after the express, so the transfer wait is not onerous. This transfer process actually allows reasonable service for anyone west of Framingham going to any of the stations between Natick Center & Boston Landing. 4a) Boston Landing added to P510: Since 12/1/16, the decision was made to add Boston Landing to P510. This is because the Heart to Hub train prevents a Framingham originating local train from leaving right after P510 comes through Framingham. Passengers on P510 originating west of Framingham would face a 40 minute wait at Framingham to transfer to P590 to get to Boston Landing if P510 didn't stop at Boston Landing. 5) P506 now an express: The major element of my proposal and petition was the conversion of P506 to an express train, with a new local Framingham-originating train right behind it. That's what we wanted and that's what we got! Our hope is that this change moves some passengers from P508 to P506, thereby alleviating some of the overcrowding on P508. So if you are a P508 passenger, start thinking about what you can do to move to P506! a) The outbound set of equipment used for this service can continue west to Ashland without needing to depart Boston substantially earlier. In other words, the equipment & personnel are available and it's possible. b) There are no conflicting train movements in the area which would preclude P590 making a 'turn' in Ashland. c) Ashland has the largest parking capacity on the line, and both lots never come close to being filled at any point during the day. d) A later morning inbound trip from Ashland could theoretically align with the addition of Ashland to the outbound evening "Heart to Hub" express train which is later in the evening (see below for details on PM schedule). In other words, perhaps some passengers will be able to take advantage of a slightly shifted workday schedule in Boston (~10 AM to ~7 PM?) by taking P590 in the morning and P552 (the Heart to Hub) in the evening. e) Adding Ashland to P590 should not impact the crowding on the train, since it has excess capacity. f) Adding Ashland to P590 does not impact riders from Framingham east since the added stop has not changed departure times from any other station for P590. 7) Renumbering of trains: The MBTA has renumbered the local trains (vs. the current schedule and the draft I published on 12/1/16). The elimination of using "P580" as a train number and starting with "P582" now means that the equipment turns have increasing numbers for each set of equipment. For example, on the current schedule, train P581 comes outbound from Boston and turns in Framingham to become P580. By skipping the number 580 on this new schedule, P581 will now come outbound from Boston and turn at Framingham to become P582, which is much more intuitive - all outbound trains will increment by one digit UP at Framingham for their inbound turn. a) Ridership: The ridership for P589 is quite low. The ridership for P517 isn't terrible, but it still isn't incredibly high. b) Set utilization: By eliminating one set from the early rush hour 'rotation,' a set becomes available to serve as a spare for the rush hour commute. This increases the resiliancy of the equipment fleet for the entire rush hour service schedule. 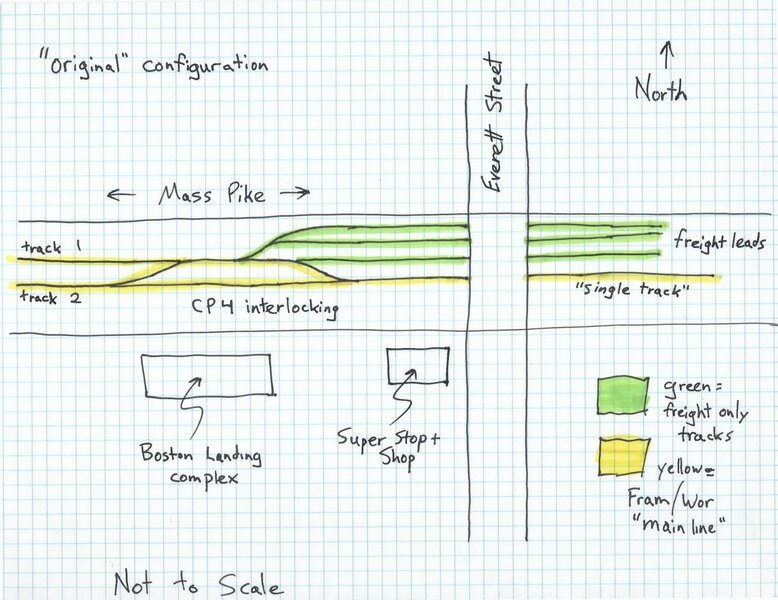 c) Track utilization: By eliminating one set from going to Framingham and coming back into Boston early in the evening commute, the tracks have less trains running across them, allowing for less congestion and better resiliancy. 9) Addition of Framingham & Ashland to Heart to Hub train: The PM Heart to Hub train departing South Station at 7:35 PM has excess capacity (OK, that's the politically correct way of saying it has low ridership). Adding Framingham and Ashland does not substantially increase the transit time of the trip to Worcester, and may draw additional ridership onto this train. Why Framingham and Ashland? a) Framingham has the highest ridership of any station on the line. 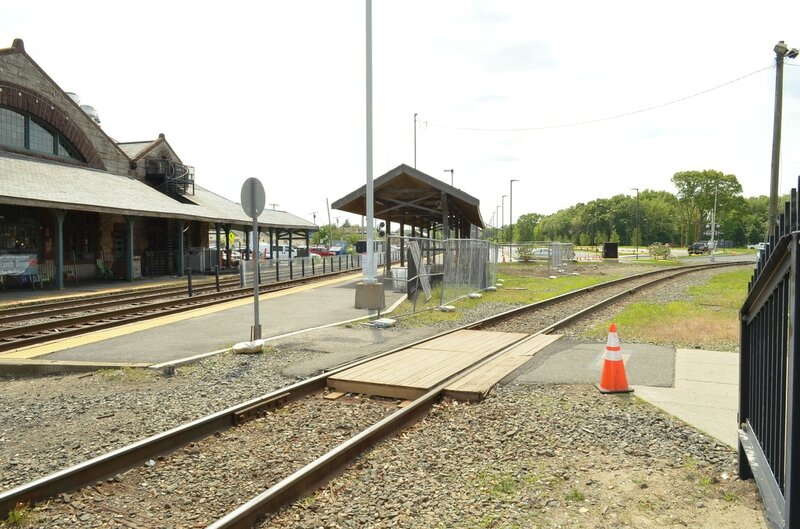 Also, due to the signals, grade crossings, and physical characteristics of the line, trains already operate at reduced speed through Framingham, so adding the station stop is not eliminating a high speed segment of the trip. Finally, the construction of the new parking lot on the north side of the station will add over 200 parking spaces to the station area. b) Ashland (as noted in #6 above) has excess parking capacity. Also, matching it up with the AM P590 trip offers a possible 'alternative' workday schedule for some commuters / potential passengers for the Heart to Hub. Finally, a new Transit Oriented Development project near the Ashland station may result in increased ridership to/from Ashland station - some of whom could potentially utilize the evening Heart to Hub train. 10) Standardized headways: From 4:20 PM to 5:50 PM, the schedule now operates on a fixed 40 minute headway for each local train and each express train, with 10 minutes between an express and a local train. In other words, with the exception of West Natick and Framingham (which are serviced by both express and local trains), a train departs for each destination west of Boston every 40 minutes. For example, Worcester bound passengers can depart South Station at 4:20 PM, 5:00 PM, and 5:40 PM. Passengers bound for Natick Center (as an example) can depart South Station at 4:30 PM, 5:10 PM, and 5:50 PM. These standardized headways are the best compromise between frequent service and the spacing of trains to avoid conflicts. As many of you are aware, the 25 minute spacing between the current 5:15 PM local (P593) and the 5:40 express (P523) is just too close - P523 frequently 'catches up' to P593 before Framingham. Increasing that spacing to 30 minutes (along with changing the equipment rotation) should solve that problem. Many of you may recall the 20 minute headway between local trains on previous schedules - a 5:15 PM local departure from South Station was followed by a 5:35 PM local departure from South Station. As previously discussed on this blog, that was only possible with a 'leapfrog' move - the 5:30 PM express train went AROUND the 5:15 PM local train. While that was a nifty move, it was perilous for the schedule - if anything went wrong and there were any delays, the delays could rapidly become widespread and substantial. We just don't have good enough infrastructure to keep a leapfrog move on the schedule. A (quite long) third passing track is really needed to be able to reliably include a leapfrog move on our schedule. We spent a fair amount of time exploring the options for evening headways and looking at the pros and cons of various options. The Worcester Working Group feels that the 40 minute headway system for the height of the rush hour is the most reliable schedule at the most frequent service interval possible. We spent time learning about the infrastructure constraints that if solved would allow for more frequent service. Hopefully there will be announcements in the near future about some infrastructure projects that will benefit us. 11) The 5:50 PM train no longer operates to Worcester: The current P525 departs South Station at 5:50 PM and operates all the way to Worcester. But P523 departs South Station at 5:40 PM and operates all the way to Worcester, so having the Ashland to Worcester stops on P525 is somewhat duplicative. Removing the Ashland to Worcester segment from P525 improves congestion at Worcester, which has been a problem in the ~7 PM to ~9 PM window on the current schedule. Service to stations from Ashland to Worcester is not substantially or realistically reduced. d) The positioning of the layover yard EAST of Worcester station. The current schedule includes a number of trains which arrive at Worcester less than 30 minutes after the preceding train. While that can sometimes work, it is only possible if everything happens precisely on time. Increasing the interval to 30 minutes for each arrival increases the resiliancy and reliability of the entire schedule. So, how does this affect the 6 PM to 7 PM window of Boston departures? With the Heart to Hub arriving in Worcester at 8:45 PM, the latest arrival of the previous train is ~8:15 PM. This pushes it back to a 6:45 PM departure from South Station, which also squeezes the departure of the previous train between that and the 5:50 PM local. Taking a closer look at these timings, you can see that it is impossible to continue the 40 minute express / local pattern after 5:50 PM - everything would get jammed up and there would be a long interval of no service to particular stations. Therefore keeping the ~6 PM to ~7:30 PM Boston departures similar to what they are now offers reasonable service to the most stations. The current 6:20 PM "limited" train departing South Station is moved earlier 5 minutes, but it can't become an express and skip the Wellesleys and Natick Center. If it did, then those stations would not have service for an entire hour between the 5:50 PM and 6:45 PM Boston departures. 13a) Boston Landing passengers can get to P521: P521, the 5 PM South Station express to Worcester, is the most popular evening train. Although it doesn't stop at Boston Landing, those passengers can take INBOUND P520 from Boston Landing at 4:59 PM and get off at Yawkey at 5:04 PM. They can then board outbound P521 at Yawkey at 5:11 PM. 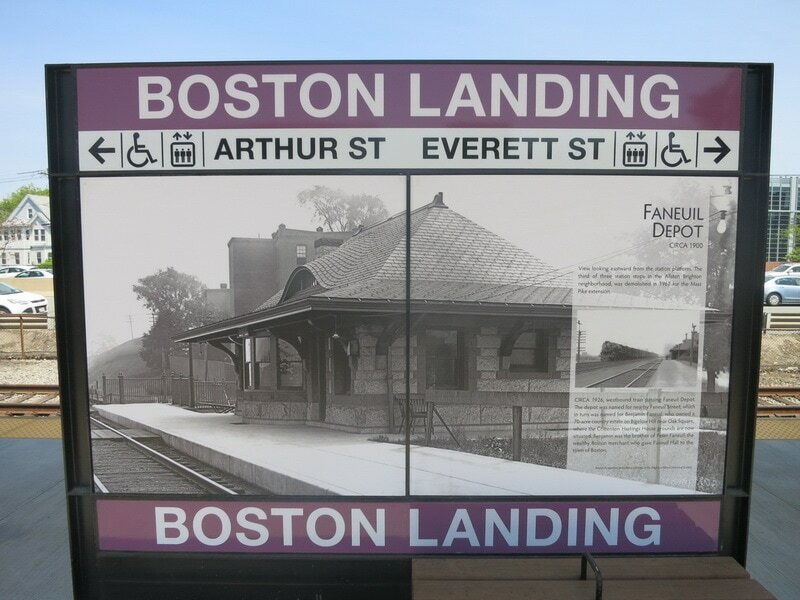 13b) Boston Landing added to P525: Without a similar inbound-outbound trick to reasonably access P523, the next train servicing stations west of Framingham is P525. 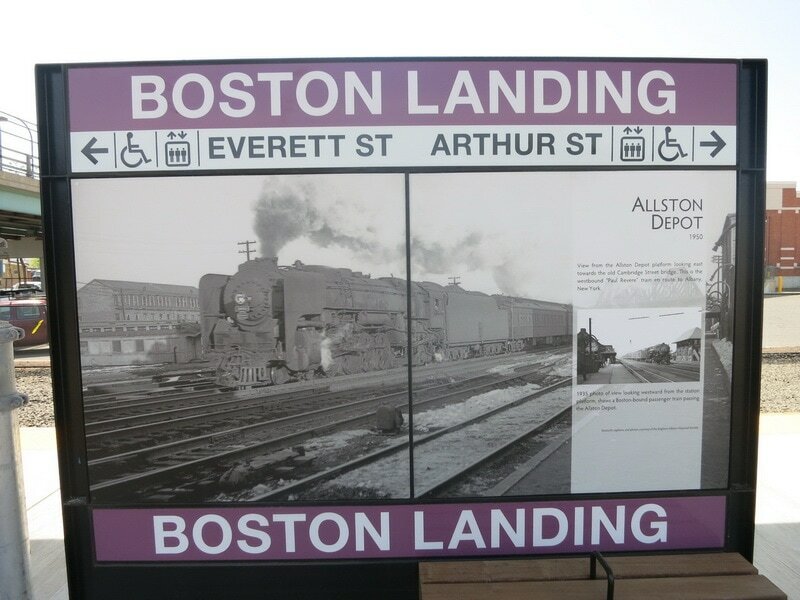 A stop at Boston Landing has been added to that train since there is also no corresponding inbound-outbound trick for Boston Landing passengers to access P525. Boston Landing passengers can use P593 to Framingham and transfer to P523, but that requires a ~18 minute wait at Framingham. a) Worcester Line Working Group completes finalizing entire new weekday draft proposed schedule by Christmas (COMPLETE). b) Early January: MBTA formally publishes draft schedule and begins 6 week public comment period. Public Hearings will be held, although the venues and schedule haven't been worked out yet. c) Mid-February: End of 6 week public comment period. d) Mid-February to Mid-March: MBTA, Keolis, and Worcester Line Working Group reconvenes to review public comments & finalize new schedule. 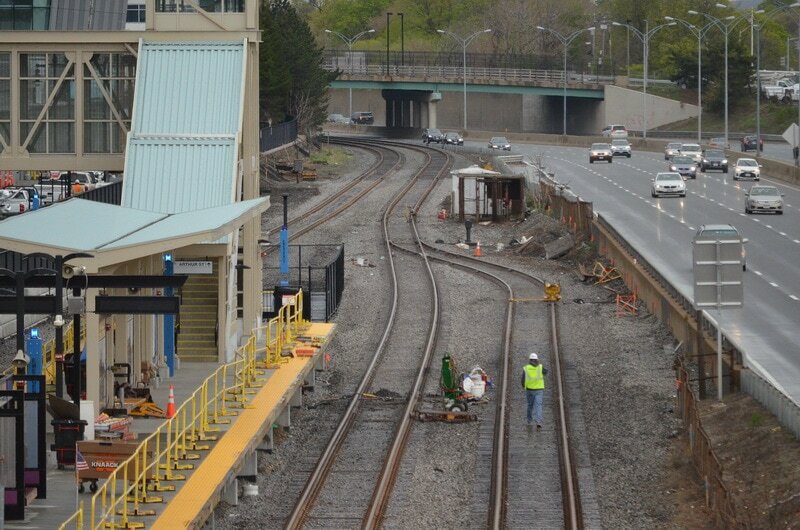 e) Mid-March to early April: Keolis builds final equipment & crew rotations for new schedule. f) Early April to mid-May: Crews choose new assignments (this always happens for 6-8 weeks prior to every new schedule being published in May or November). g) May 22, 2017: New schedule implemented. This is a pretty exciting example of activism and everyone coming together behind a petition with a government agency responding and making the requested change. Our voices did matter and we're on the way to a better schedule! Even though we're not done, it's important to note that the Working Group included many people who all contributed and engaged very constructively. It has been a very collaborative process and I'm glad I got to be a part of it. Besides me, the Working Group includes Lt. Governor Karyn Polito, Rep. Alice Peisch (D - Wellesley), Rep. Carolyn Dykema (D - Southboro, Westboro), Rep. James O'Day (D - Worcester), Stuart Loosemore (Worcester Chamber of Commerce), Jessica Strunkin (495/Metrowest Partnership), Brian Shortsleeve (MBTA General Manager), Jody Ray (MBTA Assistant General Manager in charge of Commuter Rail Railroad Operations), two Deputy Directors of MBTA Railroad Operations, David Scorey (Keolis CEO/GM), the Keolis Manager of Operations Planning, and another general public member / commuter from Wellesley. Stay tuned to this blog and I'll publish updates on the Public Comment process as soon as it is finalized. Subscribe to get e-mail updates when the blog is updated.